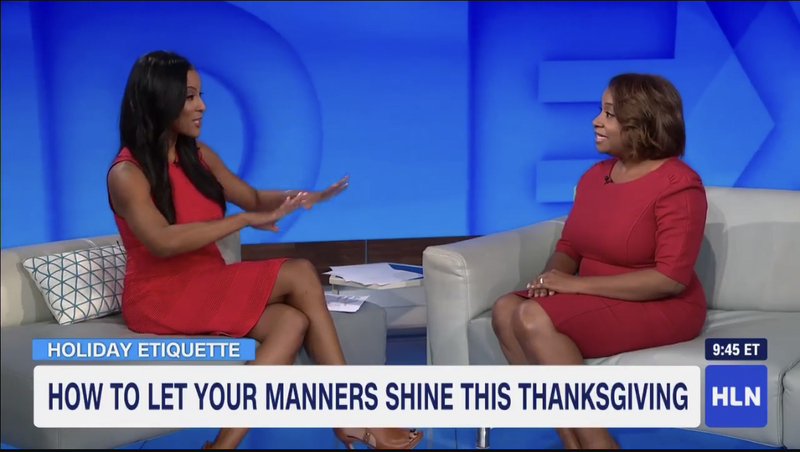 Just in time for Thanksgiving, I was invited by CNN’s HLN Weekend Express to share holiday etiquette tips. Host Shyann Malone posed a variety of questions that ranged from the appropriate time to decorate for Christmas to what to bring when being hosted in someone’s home. It was a great way to kick off the holiday season! The day started with 8:30am security check-in. From there, my youngest daughter and I were escorted up the escalator to a second security station which allowed us access to the elevators. 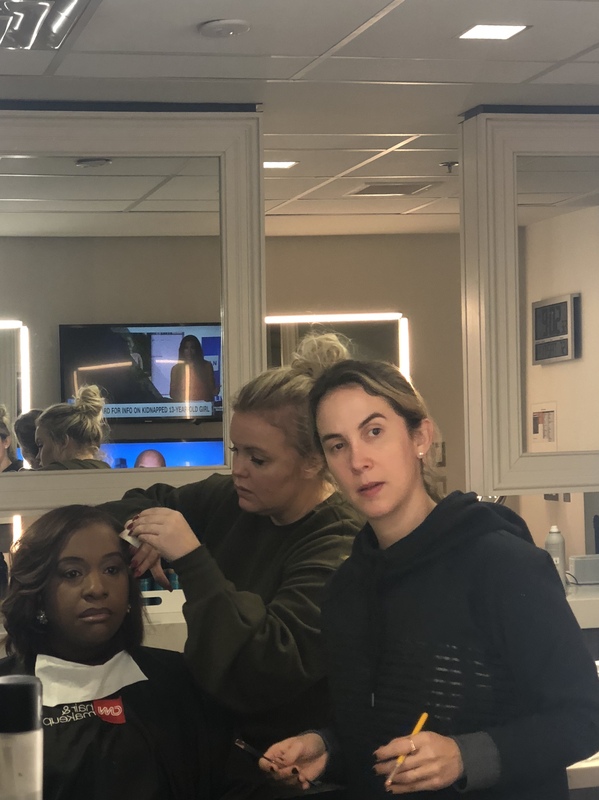 Made a quick trip to CNN’s Hair and Makeup (the team is terrific) and was whisked away to the studio to have my microphone put into place. You’ll find the full interview here. 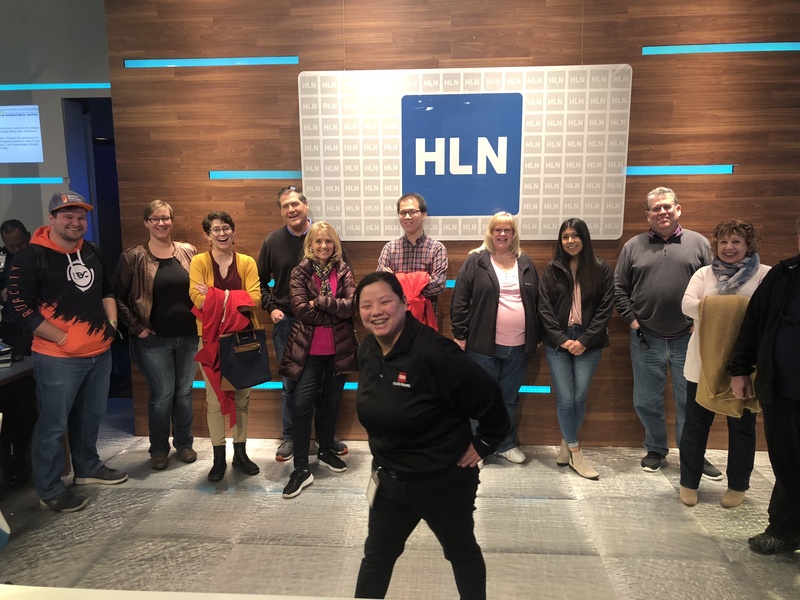 Sharing a few behind the scenes snapshots from our morning at CNN! In the South, good manners are passed down like a treasured family recipe for pecan pie. However, unlike the formula for a favorite after-dinner treat, guidelines to being well-mannered are changing with the times. 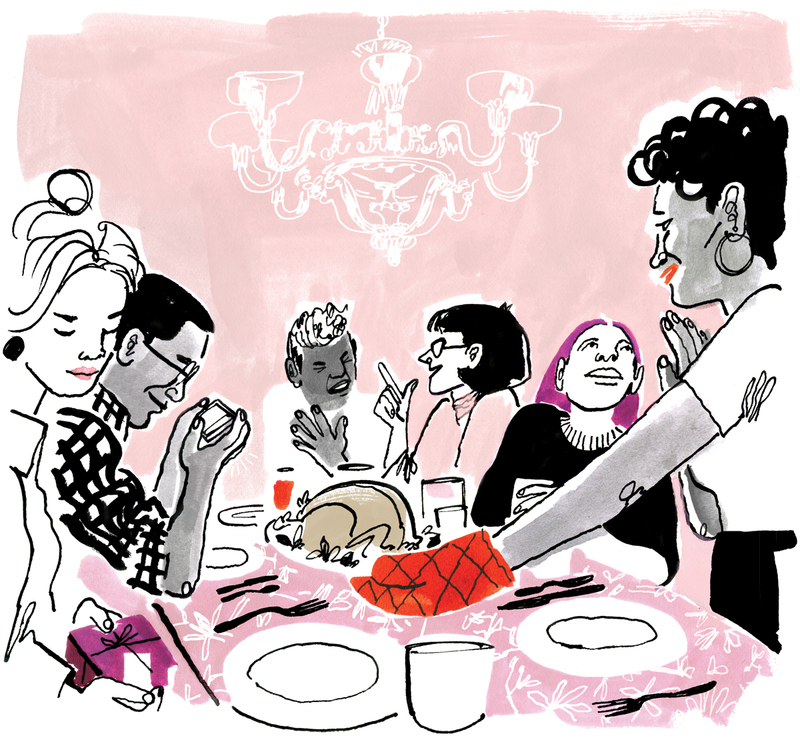 With the abundance of social gatherings the holidays bring, many of our etiquette conundrums surface, and we are left feeling confused about how to be a gracious host or guest. 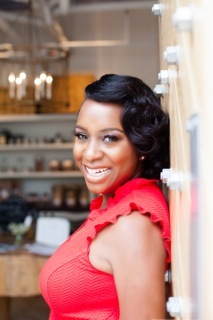 Each week during the holiday season, Erika Preval of Charm Etiquette school in Atlanta, will answer a question that helps us navigate the grey area of modern etiquette. The guest list was difficult, but I’ve heard that addressing invitations is also a challenge. We’re placing our stationery order soon. What should we consider before we address the envelopes? SIGNED – Envelopes of wedding invitations should be handwritten. If your handwriting isn’t impeccable hire a calligrapher. 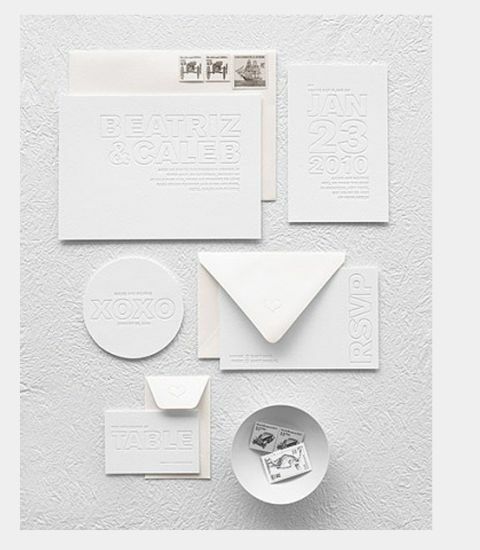 They will require at least two weeks for lettering, so request envelopes ahead of invitations from your stationer. Invest in calligraphy software that can print directly onto the envelopes, if time or budget don’t allow for a professional calligrapher. SEALED – Avoid confusion of who is (and isn’t) invited by carefully addressing your inner envelope. Spouses of guests are always invited. Deciding to include a guest for single friends is at your discretion. If they’ve been a couple for over 6 months, consider a plus-one who should either receive a separate invitation, have their name appear on a separate line on the inner envelope, or have the notation of recipient’s name “and Guest”. Names of children should appear beneath their parents. Boys carry the honorific “Master” through age 16, and girls “Miss” until age 18. Children over the age of 18 should receive their own invitation, even if living within the same household. DELIVERED – Traditionally the inner envelope ensured that a wedding invitation, having travelled via horse and carriage, arrived in pristine condition to its recipients. Though the mode of transportation has been updated, invitations can still be damaged en route to your guests. Canceling your stamps by hand in lieu of sending invitations through a machine is one way to prevent bent envelopes, and the like. The USPS officially ceased hand-canceling, but there are still post offices that allow it. Choose a post office that is less busy and try dropping the invitations off in small batches or pay a non-machinable fee for greater success. Tip: You’ve likely spent a good bit of time gathering addresses of guests. Keep this list handy for upcoming showers, thank you notes and holiday cards. In the South, good manners are passed down like a treasured family recipe for pecan pie. However, unlike the formula for a favorite after-dinner treat, guidelines to being well-mannered are changing with the times. With the approaching wedding season—that brings an abundance of gatherings—many of our etiquette conundrums surface, and we are left feeling confused about social protocol. 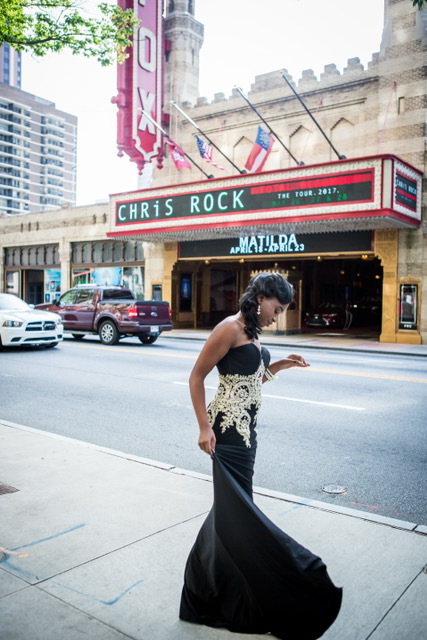 Every other week throughout wedding season, Erika Preval of Charm Etiquette school in Atlanta, will answer a question that helps us navigate the grey area of modern etiquette. I’ve been trying to plan the perfect proposal since buying my girlfriend’s engagement ring last month. Pinterest has lots of elaborate ideas, but I’m not really sure that she’s looking for anything over the top. Asking opinions of her friends and family might ruin the surprise. I’m getting really nervous about messing this up. Is there proposal etiquette that can guide me? With the emergence of proposal planners and videos of marriage proposals going viral online, I can understand your anxiety over making yours perfect. 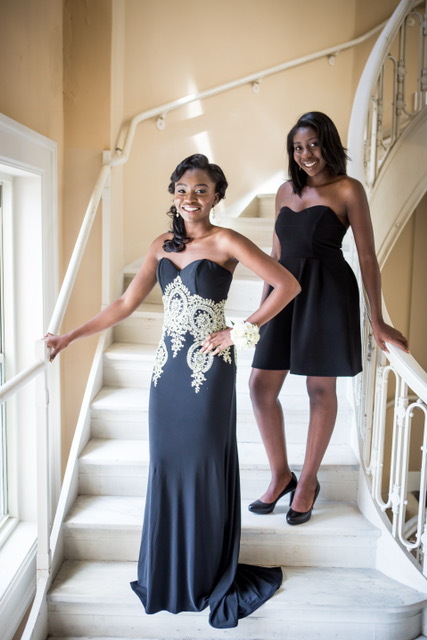 Keeping your focus on your lady in waiting is most important for a successful event. As you continue to plan your special moment, consider this advice before, during and after you pop the question. Stay in good graces - Tradition dictates the request of her hand in marriage, from her father, prior to your proposal. I suggest that you make both sets of parents – hers and yours, aware of your intentions. This will create a wonderful foundation of respect and consideration for the merging of your families. Since you’re ready to become engaged, chances are that you’ve already discussed marriage with your girlfriend. So, should someone have a slip of the tongue (barring shared details) your surprise will still be safe. Nevertheless, ask for the parents’ discretion. Stay focused on her - Although there is a trend towards having elaborate proposals with an audience of family and friends incorporated, please know that only two people are necessary to make your proposal perfect: you and your sweetheart. You have the rest of your lives to share your proposal story, so if it relieves any anxiety, know that (unless she’s expressed otherwise) most brides prefer an intimate proposal. No matter public or private, after expressing to her your reasons for wanting to do so, get down on one knee to utter those four magical words. You’ll likely want to arrange for a photographer, videographer or both to capture this moment. If your budget is constrained, opt for a discreet friend with a steady hand. Stay offline awhile - If you’ve chosen to keep the proposal private, you’ll want to share news of your engagement once the celebration with your fiancée is complete. Some gentlemen will have already arranged a surprise engagement party of sorts with close family and friends at a separate location. Should this not be the case for you, refrain from announcing your engagement to online friends and followers on social media until you’ve had time to connect with those closest to you by call or text with the big news. I wish you all the best on your proposal and beyond. 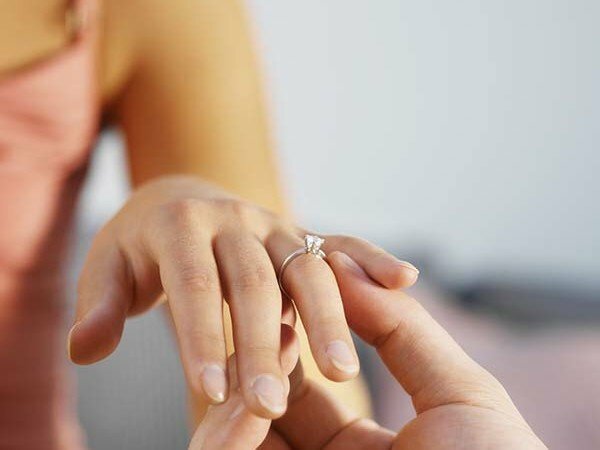 Be certain to insure the engagement ring and try not to rush into wedding planning mode – savor the moment! While it’s always exciting to share advice, it’s even more meaningful when it finds its way into press. It gives me the ability to provide tips to an even wider audience in hopes that everyone will feel a bit more comfortable socially. Gray Chapman was such a great writer to work with and I love that she included all of the local businesses I’d mentioned. Hope you enjoy the piece! Do people still bring hostess gifts? Never show up empty-handed. My go-to’s are tins of Beautiful Briny Sea salt, pralines from Greene’s, baked goods from Star Provisions, and Savannah Bee Company’s rare black sage honey. Steve McKenzie’s has a great assortment of practical items like coasters, votive candles, and corkscrews—all much more unique than a bottle of wine. Talk of politics is almost inevitable. There are subjects that should be shied away from to ensure you stay in pleasant company. Among acquaintances, politics is on that list. Try your best to change the subject to something else the person is passionate about. If you find that the conversation continues to spin itself back to politics, remain respectful—even if it means agreeing to disagree. You’ll find the rest of the article here! This article originally appeared in Atlanta Magazine’s November 2017 issue. Social media platforms like LinkedIn have greatly advanced the way that we network online, but face-to-face interactions have yet to change at the same pace. For example, when attending networking events the most common way of staying connected to new contacts is still through the exchange of business cards. Making a great and lasting impression is tantamount in this social scenario. Master these three tips and you’ll appear even more polished and serious about establishing new relationships. When someone offers you his or her business card, accept it using your right hand. Take time to look at it, thank the person by using their name and find something about the card to compliment. You can then put the card away in the back of your card case or another place for safekeeping (not tossed into the bottom of your purse). Their card should be kept as neat and tidy as your own and please resist the temptation to write any notes on it – that would be considered rude. Note that this exchange may look different in other parts of the world. Research the customs of your destination when traveling abroad so that you’re well prepared. In Japan, for example, business cards are always received with two hands but can be given with only one. Once you’ve taken the time to create a personal connection with someone, and you’d like to contact them again, ask for their business card. It’s likely that they’ll reciprocate and ask for yours, as well. If there’s not an opportunity for a mutual exchange of cards (they’ve run out of cards, etc), it’s polite to respond with, “May I offer you my business card and follow up within a few days?” but you must ask. In this instance, connecting via LinkedIn is a great next step, as the platform can now serve as their virtual business card and point of contact. Consider your business card an extension of your personal brand. When you pass your card out as if you were dealing playing cards, you devalue your brand and also miss the opportunity to get to know and connect with others. Be selective in giving out your card. 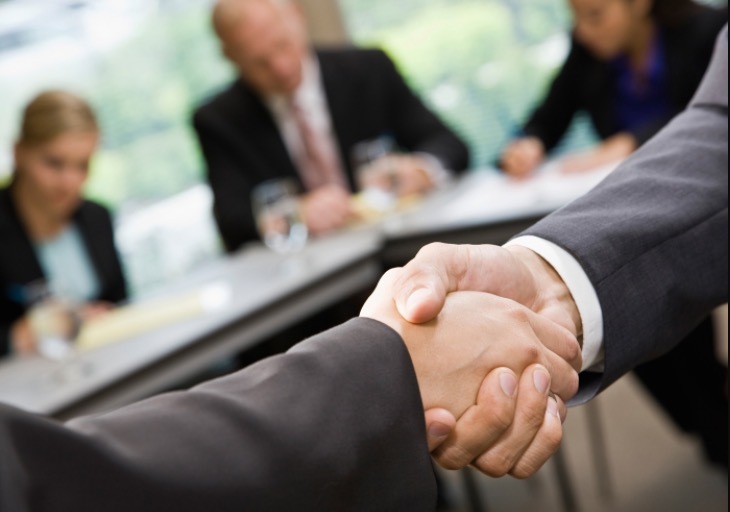 Networking is about establishing contacts and finding a fit for a possible business relationship. Your card, alone, cannot make that happen. Making a strong impression that makes someone want to continue the conversation will. Leaving a networking event with five good business leads will enrich your network more than blindly giving out 50 business cards to people you’ll likely never hear from again. As with all social scenarios, exchanging business cards has its own rules of etiquette. Practice these and you’ll be well on your way to making an impression that results in a growing network of business contacts. Terra’s Kitchen recently recently asked for some top tips for table manners for kids. Of course, I was happy to oblige! Please read their post for making table etiquette fun for the younger set and let me know how things go with your family! While teaching your kids table manners is an important life skill, it can be a challenge getting them excited about it. Learning table etiquette doesn’t have to be boring, though. Teaching table manners at regular family dinners will help make good manners a habit and it’ll allow them to feel more grown up (what kid doesn’t want that?). 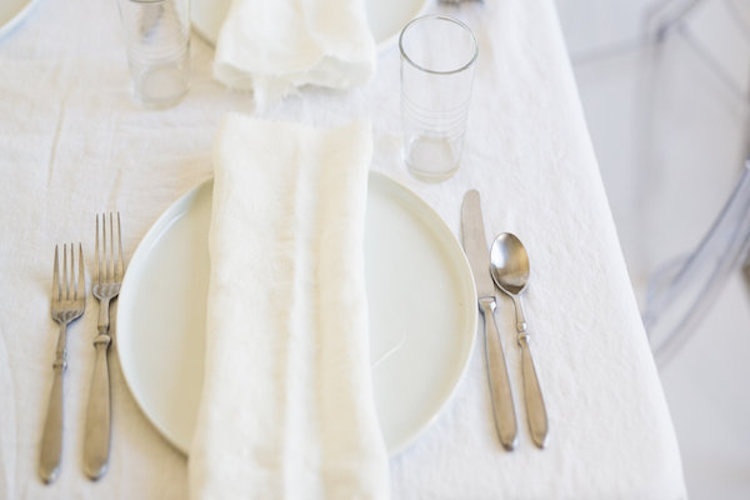 We asked Erika Preval of Charm Etiquette to share her tips for teaching kids dining etiquette. Make the “ok” sign with both hands. The alphabets “b” and “d” can help them remember to place the bread plate on the left and drinks on the right. If your kids are good at spelling and math, this is an easy one: there are four letters in the words fork and left, and five in knife, spoon, and right. Flatware should be placed accordingly. When setting the table and during the meal, the blade of your knife should always be turned toward you. Remind your kids that it should never be aggressively pointed toward your neighbor. If you’ve had to deal with your kids arguing over taking up space on the kitchen table, you will love this tip: no elbows on the table! Hands stay in your lap unless they’re being used to eat, drink, or passing an item. We know how amazing dinner looks, but wait until everyone is served before you begin eating. Chew small bites of food with your mouth closed and lips together to prevent smacking and speed up your response to conversations. Don’t talk until you swallow. Ask for things that you can’t reach at the table to be passed to you. During the meal, it’s important to take time to compliment the food and thank the person who prepared the meal. If you need to ask to be excused when you’ve finished eating, remember to first offer to help clear the table. More tips for making dining and manners fun for kids can be found at Terra’s Kitchen! Senior year comes with lots of lasts: the last first day of school, the last yearbook photos, and the last prom. 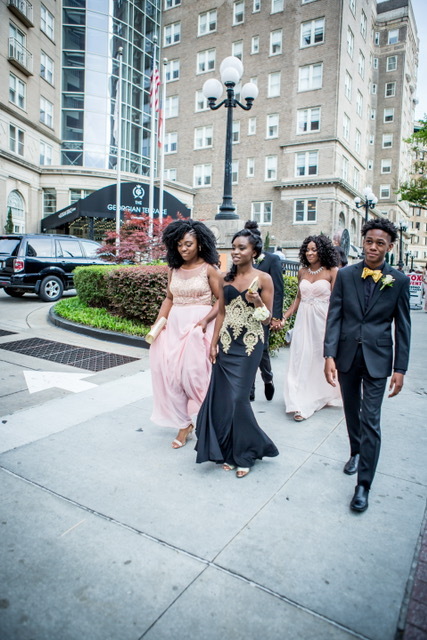 It’s my daughter’s senior year, and I’ve done my best to document these moments along the way. 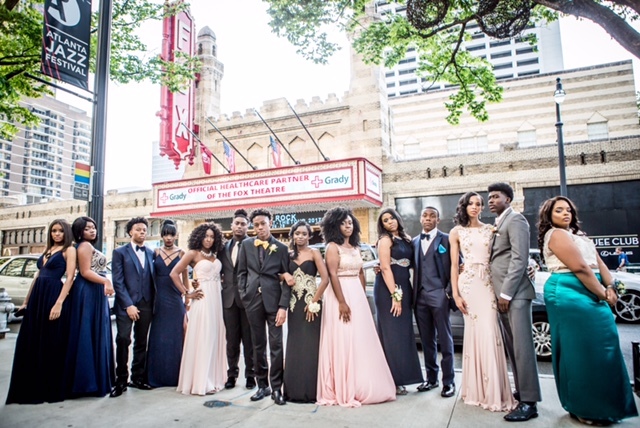 To stay in the moment I hosted a pre-prom picture party within a suite at The Georgian Terrace (prom was across the street at the Fox Theatre) and hired Janet Howard to capture the event. If you follow my Instagram, you’ve seen a few of the 300+ photos Janet sent over. 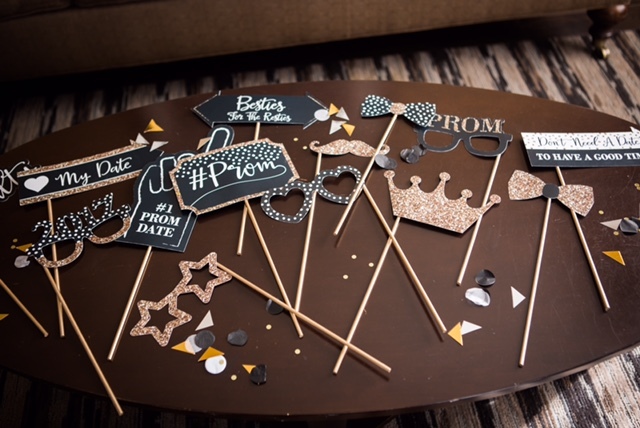 I’ll share more here, as well as some tips for hosting a similar party for your teens. Hire a photographer. 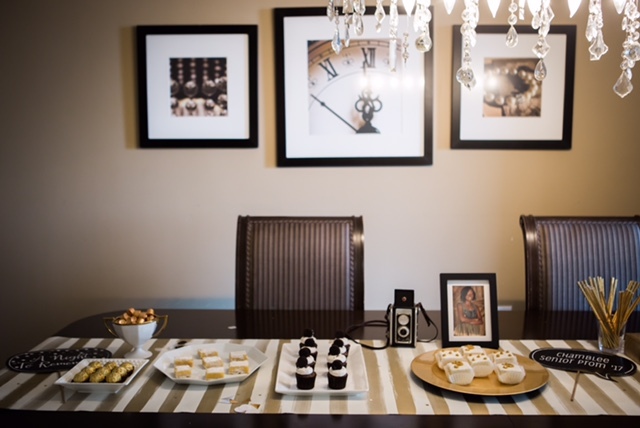 We invited parents to take their own photos, but there’s nothing like enjoying an event and knowing that a professional is capturing every moment. 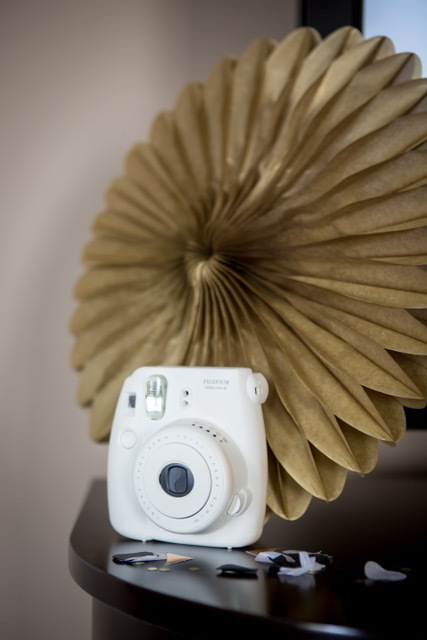 Our guests are able to access all of the photos and download as many as they’d like at no charge. Keep decorations simple. Guests won’t be with you very long, so be sure your decorations serve as functional props. For this event, I had trays of sweet small bites, soda and still and sparkling water. 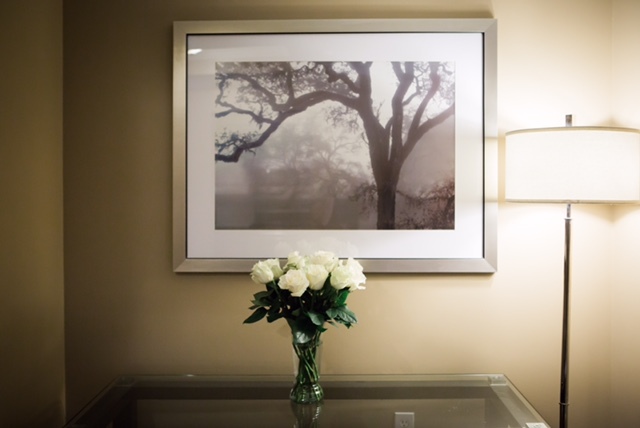 A simple vase of Whole Foods roses was placed in the entryway and photo booth props from BigDotofHappiness were scattered on tables throughout the suite. Gold accents from Paper Source, a vintage camera and West Elm frame for signing were all it took to set the tone for the party. Set a time, but be flexible with the timeline. I used an electronic Paperless Post invitation (you can always order a single paper copy for your memories) and gave a timeline for photos. For this occasion, however, I anticipated staggered arrivals due to the separate hair and makeup appointments of friends. Host a Sprinkle Shower – When pregnancies are a few years apart, many of the things the new baby needs will still be available and in good condition. The mother-to-be will most likely have bottles and the bassinet, but the stroller might still be in use by the older sibling. To fill in voids for baby you could host a “Sprinkle Shower” that is scaled back in both number of guests (strictly close friends and family), and items on the registry. Ask guests to bring just a few necessary items to welcome the new baby. Hold an Open House – Hosted after the baby is born, when he or she is about 1 or 2 months old. By now, the parents have had time to adjust to a routine. 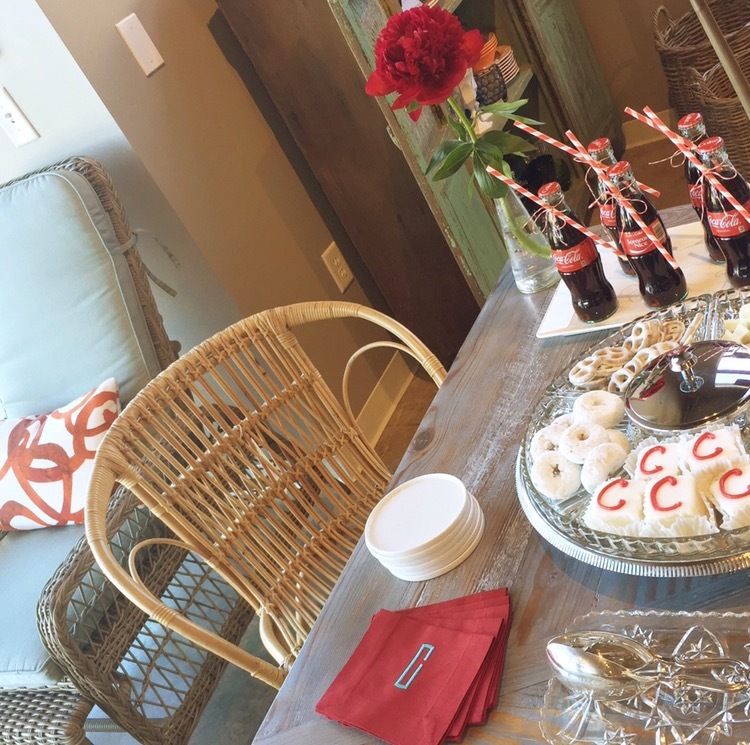 The Southern “Sip and See” is a casual and celebratory open house event. Friends and family are invited to sip on beverages, feast on small bites, and meet the newborn during a designated party time. Your invitation should indicate whether or not to come with gifts. If they are welcome, please don’t open them until after all of the guests have departed. Throw a Themed Luncheon – You might also consider hosting a themed luncheon or gathering. 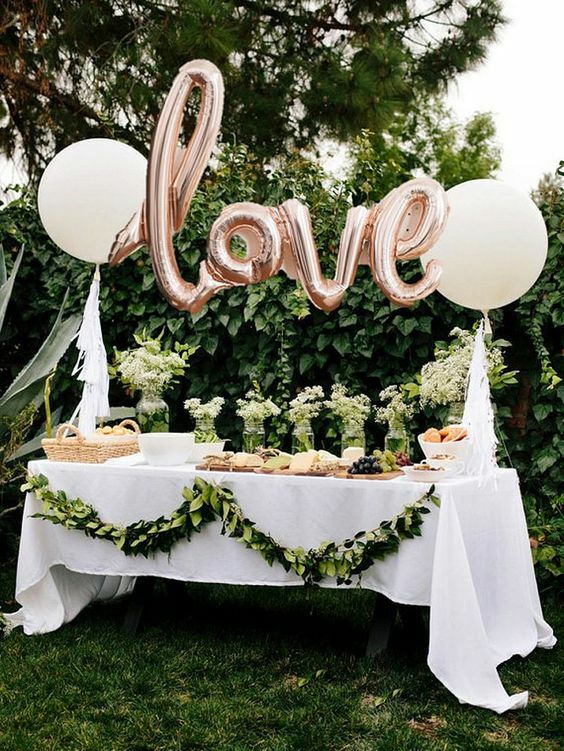 Still an intimate get-together, guests arrive with specific gift items–books for baby’s library, monogrammed silver pieces, or clothing from your sorority or college. This type of affair is more about personal charm and less about let’s complete the registry. Before planning anything, find out if the mother-to-be is comfortable having a party in her honor. You’ll be considered a thoughtful friend for running any plans by her before the invitations go out to guests. Q: I’m the maid of honor in my best friend’s wedding. She’s having two other showers, and the bridesmaids and I want to host a monogram bridal shower at her favorite restaurant. Should the guests pay for their meals and how do we decide who’s invited? We’d appreciate any suggestions. A: This shower’s monogram theme is perfect since hers will be changing soon – how thoughtful. Here are a few tips to get you on your way. Enjoy yourselves! 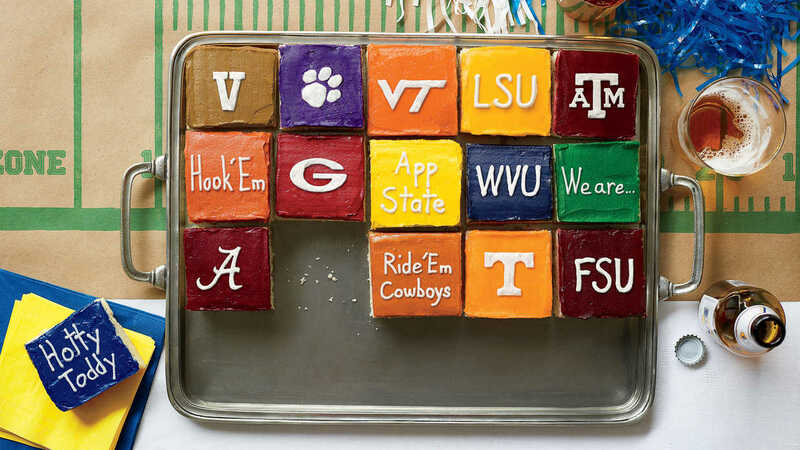 Tally it up - As with any event, the host covers all costs, including food and beverage. If they’ve agreed to host, share the budget with the bridesmaids to clarify how things will be paid for. Should costs be a challenge, scale the event back to something that is a bit more budget-friendly but still reflects the bride’s style. Double check - Guests of the shower must also be invited to the wedding, so use the wedding guest list as your guide. Finalize your guest list by checking for duplicate invitees to the other showers, and discussing those with their hosts. While bridesmaids are typically invited to all bridal showers, wedding guests should only be invited to one. 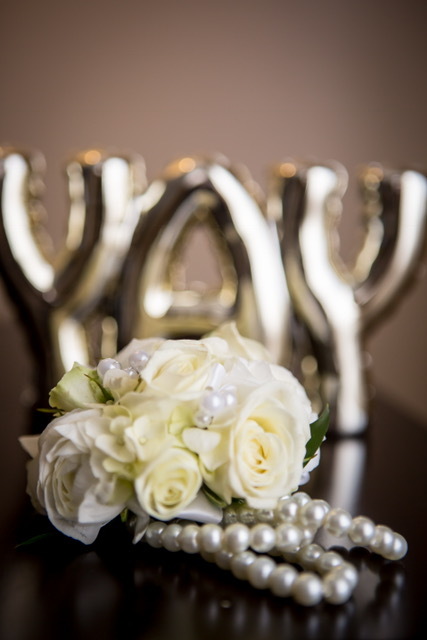 Give thanks - Ensure that the bride is equipped to be a gracious one by designating someone to record the particulars (who gave what) of gifts, as they are opened. Also, make sure stationery and postage are at the ready. Ask if she’s ordered her own. If not, you can add matching thank you notes to your invitation order. Tip: Don’t forget to save the bows and ribbons from opened gifts. 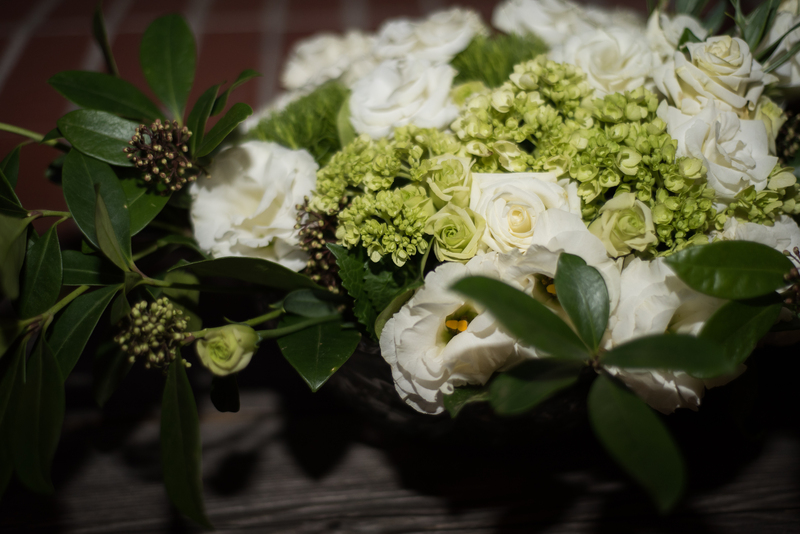 They’re traditionally fashioned into a bouquet, of sorts, for the bride’s use during the wedding rehearsal. Personal (Party) Foul – Don’t show up empty-handed! Bring an item to share or offer money to offset the costs for your hosts. Also, be sure to bring along food that will sustain you throughout the activities of the day should you have allergies or a restricted diet. Arriving late? Ask the hosts if their supply of ice could use refreshing; it’s always most appreciated. Equipment Violation – There are things that you should not assume the host will provide, such as chairs and blankets. Dress in layers because the weather tends to shift throughout the day. Dress for comfort so that you’re able to walk for long distances. Be prepared with items like tissues and hand sanitizer, as well. Unsportsmanlike Conduct – Wear your team colors. And if you’re cheering for the opposing team, try and keep things lighthearted. Your occasional “Roll Tide” in the middle of a crowd of Auburn fans is likely expected, but will be considered rude to your hosts if it persists throughout the event. Enjoy yourself and celebrate the season! GOING FOR GOLD – POLISHED. 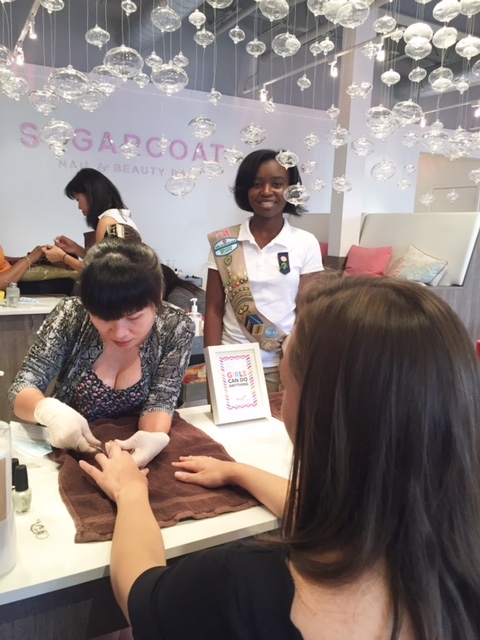 For over a year, my daughter has been working towards earning her Gold Award – Girl Scouts highest honor. 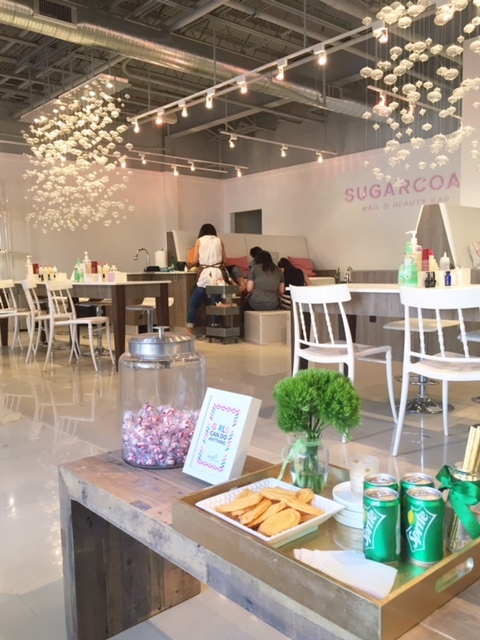 Along with the owners of Sugarcoat Nail & Beauty Bar and curlBOX, she asked me to partner with her in fulfilling her vision of creating a sustainable project (Polished.) that raises awareness and makes an impact in the area of poverty. 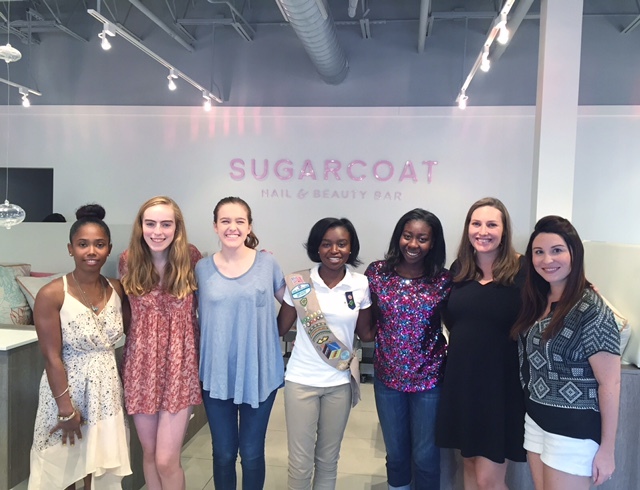 Invited guests were members of the Junior League of Atlanta and Older Girl troops within the Buckhead Service Unit of Girl Scouts of Greater Atlanta. 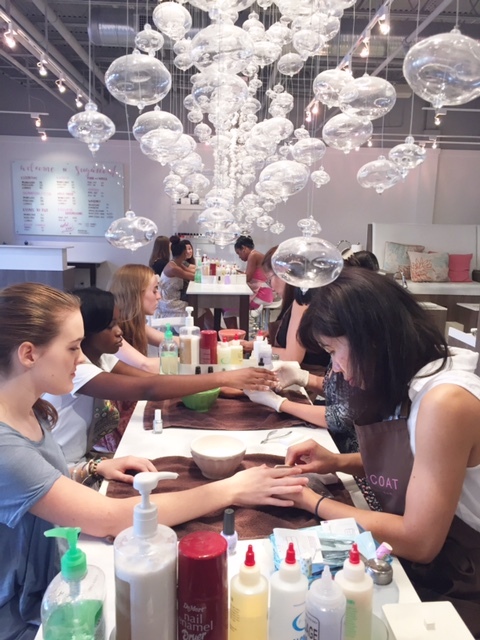 They were treated to manicures as they learned about the feminization of poverty before heading over to me for a mini-etiquette session. 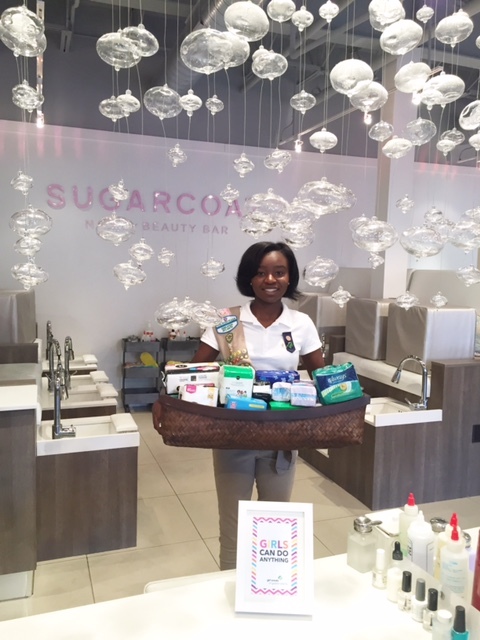 Donations of feminine hygiene products were collected during the event. These, along with haircare products donated by curlBOX, will be given to youthSpark later this month. It was around this time, a couple of weeks ago, that the girls and I decided to take an overnight trip to Birmingham. Not being our first visit, there were already a couple of favorites we looked forward to stopping by, but we wanted to try some new restaurants, too. There’s plenty to do in Birmingham, but if you’re looking for places to eat after your trip to the Science Museum and Civil Rights Institute, here are my picks for good eats on a casual road trip (with or without children). No trek to Birmingham is complete without a stop by Continental Bakery. 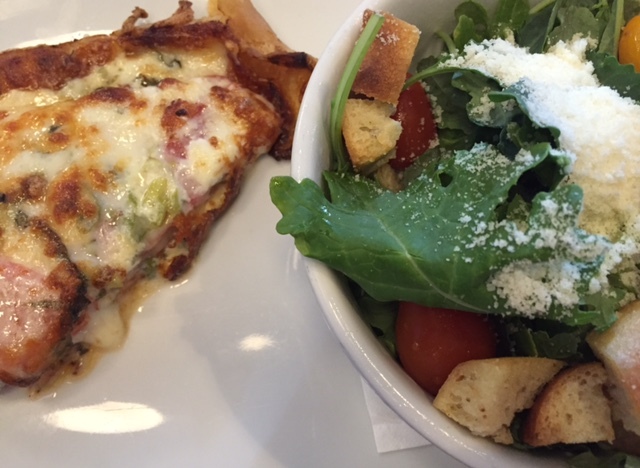 Our first visit to this Mountain Brook treasure was thanks to a Google search for crepes years ago. This whimsical bakery has delicious coffees, cakes and a fridge full of noshes from it’s dine in option Chez Lulu. It’s their variety of croissants that has the girls smitten, though. Top picks: Nutella and Cinnamon Sugar croissants and the daily frittata. Pulling into Birmingham, we opted to delay checking into the Westin and drove straight to El Barrio. There’s a full bar and some booths, but you’ll likely be seated at a communal table. The girls loved their steak tacos – everything is on the side; a build your own experience that’s great for my “picky” eaters. 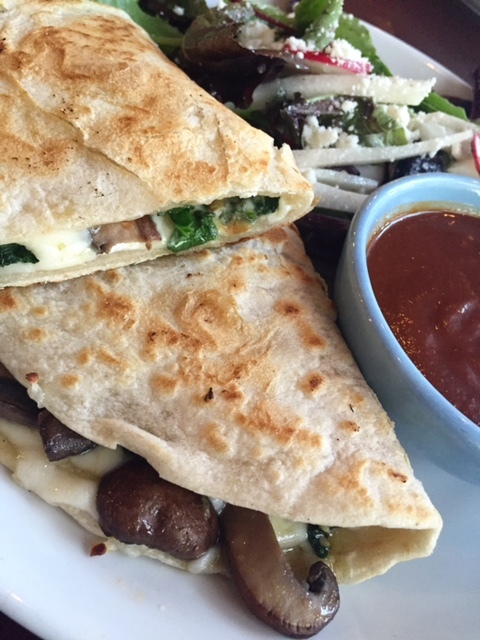 My veggie quesadilla was super yummy, as was the salad accompanying it. The churros are perfect for sharing and delicious, so you’ll want to save room for them. 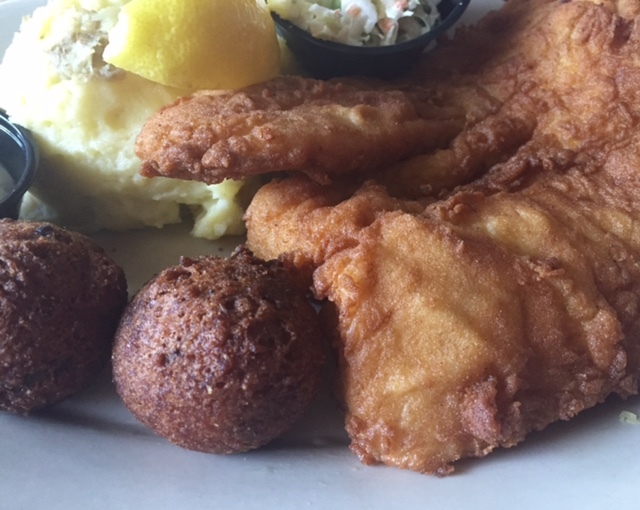 Before heading back to Atlanta, we enjoyed lunch at Southside’s FIVE Restaurant and Bar. Unassuming on the outside, this place is a total feast for the eyes once you open the door with artwork and chandeliers galore. The menu is simple, and they created a virgin version of their Strawberry Lemonade for the girls. 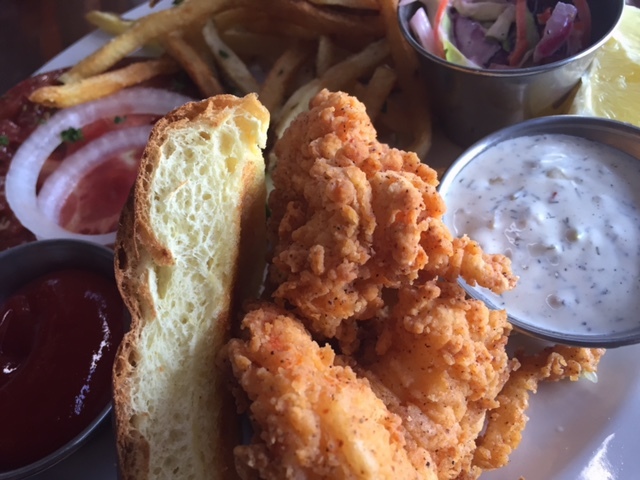 Shared the fried shrimp sandwich with one daughter; the other had chicken bites from the kids menu. Both were perfection! Enjoy the cocktail menu. Skip the dessert. 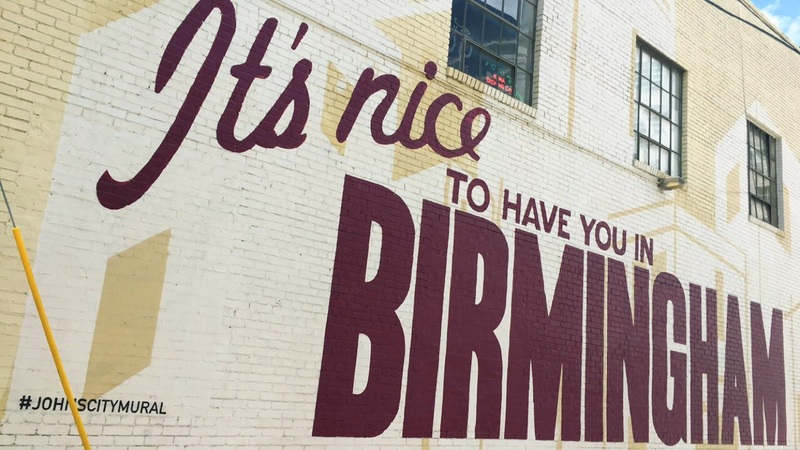 Staying overnight, you’ll likely have only one dinner in Birmingham. Wait till dusk, and head to the Avondale neighborhood’s Post Office Pies. You’ll find a chalkboard menu of their pizzas and salads on the wall. Choose your pie and order a local beer from neighbor Avondale Brewery and one of their craft sodas for the younger guests (Coffee Vanilla Bean and Orange Rosemary are the girls’ favorites). 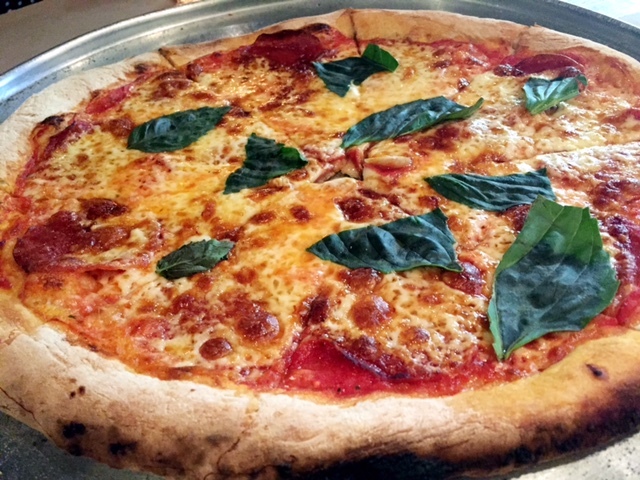 This place is no frills, so anticipate eating your slices on Kraft paper – not plates. Adults only? Enjoy the music and nightlife after dinner. Birmingham has no shortage of great bakeries. 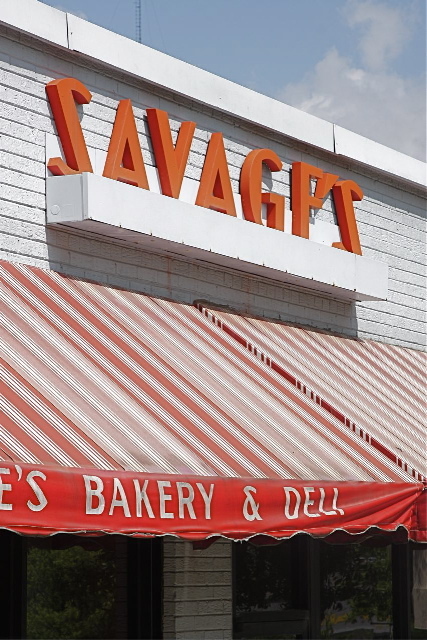 Savage’s, one of our favorites, has been around since 1939 and you’ll find it in Downtown Homewood. If you’re considering an impromptu picnic their deli has you covered. I’m a fan of their cinnamon rolls and cheese straws (and red & white striped bags), but always grab one of their signature Smiley Face cookies for photo ops. Edgewood Creamery was a new find that the girls are still talking about. A cozy space filled with options to put inside of your waffle, cake or sugar cone, this was a fun stop before heading over to Vulcan Park for a closer look at the icon you’ll see throughout your stay in the Magic City.. Excluding times I’ve lived abroad as a student, I’ve traveled solo at least once a year for nearly 20 years. 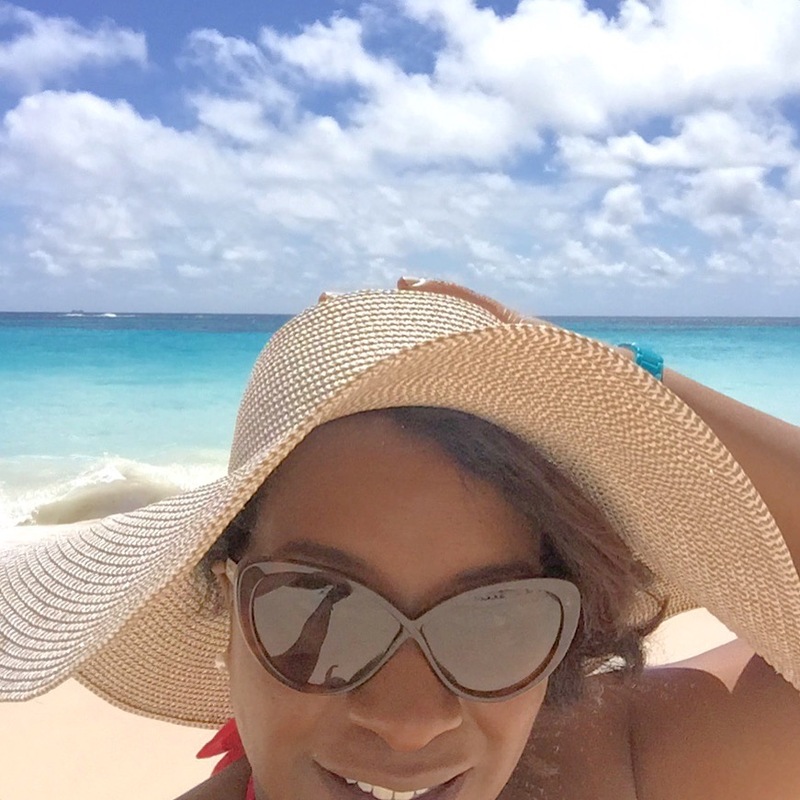 Turning 40, I decided that Bermuda had remained on my travel bucket list far too long. The trip proved to be more than worth the wait, and I cannot wait to return. There’s so much to share (if you follow me on Snapchat, you’ll concur) that I’m dividing my time there between two posts. The first will focus on the property I chose to reside in during my stay and the second will cover adventures off-property. One of the most important details when traveling alone is safety. So, I’m always very particular about my accommodations and make certain they’re aware of my plans. Rosewood Tucker’s Point makes this process easy and takes it a step further by sending over a Guest Preference form upon booking your reservation. 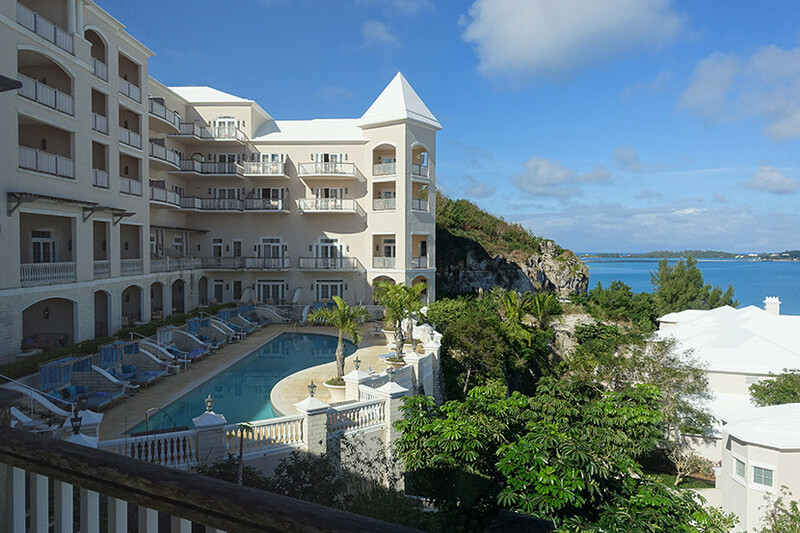 Arguably the nicest property on the island, the thoughtful inquiries on the form are just a glimpse into the level of service you can anticipate during your stay. Opting for the Manor House Poolside Deluxe Room during my 4-night stay, by the time I reached the room and walked outside to Castle Harbor Pool, I was greeted by a rain shower that ruined initial plans to lounge on my daybed and order a late poolside lunch. Before I could decide what to do next the doorbell rang announcing luggage delivery. As quickly as the sun disappeared, it returned. You’ll hear it said, and is true, that if you don’t like the weather in Bermuda, wait 5 minutes! In addition to room service and poolside dining options, there are multiple restaurants at Rosewood. During my stay, I enjoyed three of them. Sul Mer is a beachside restaurant offering a casual dining experience steps away from the Atlantic Ocean. Think French bistro, as far as cuisine. It’s the way to go for a meal that’s lighter on the waistline and the pockets. The Golf Clubhouse offers two dining options – Sul Verde and The Grille Room. Everyone raves about the Antipasti Bar at the former, and it is perfect for the guest who loves meats and cheeses. Of note is that this is also the restaurant’s only option for enjoying a salad with your meal. Sul Verde’s vegetarian pasta dish was yummy. 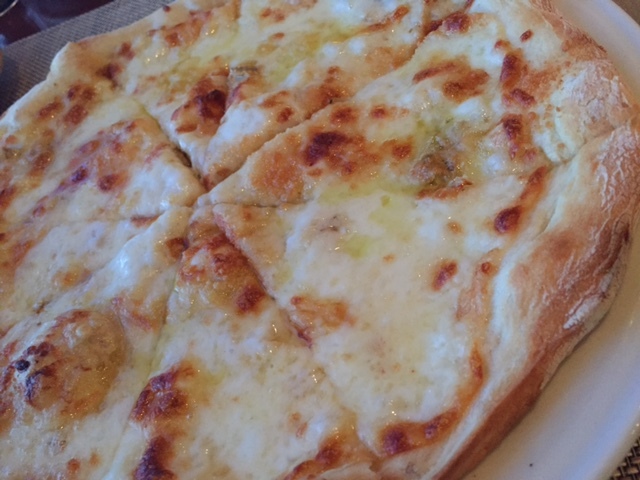 Five Cheeses pizza from the Grille Room made for a great meal, as well, and you can order it ahead for carryout. The Point is the resort’s upscale dining option. 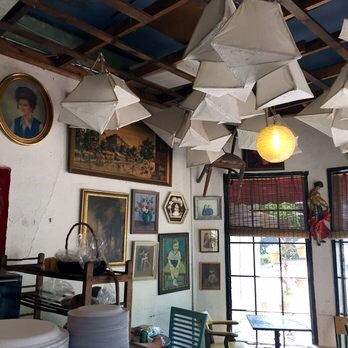 I wanted a more laid back trip, so I’ve not yet dined there, but did enjoy cocktails and Bermuda Fish Chowder right next door at Tucker’s Bar. Rosewood is part of the private resort community of Tucker’s Point Club. During your stay, you’ll take a shuttle for visits the beach, golf and tennis clubs. 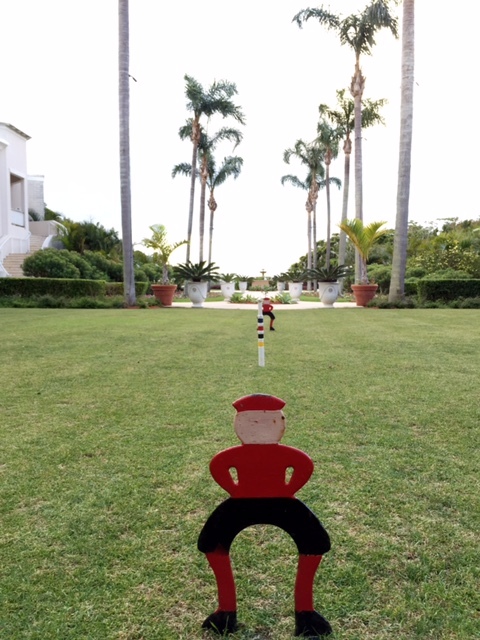 Along the way you’ll be whisked past beautiful mansions (including one owned by Michael Bloomberg) and can request a stop at The Mid Ocean Club for a round of golf. You’ll find an adult only and children’s pool at the beach, and two pools back at the resort. Castle Harbor Pool is the quieter option, but can be a bit shady at certain points of the day. Note that the poolside cabanas at Castle Harbor are for the sole use of guests within the poolside rooms, hence my choosing that accommodation. 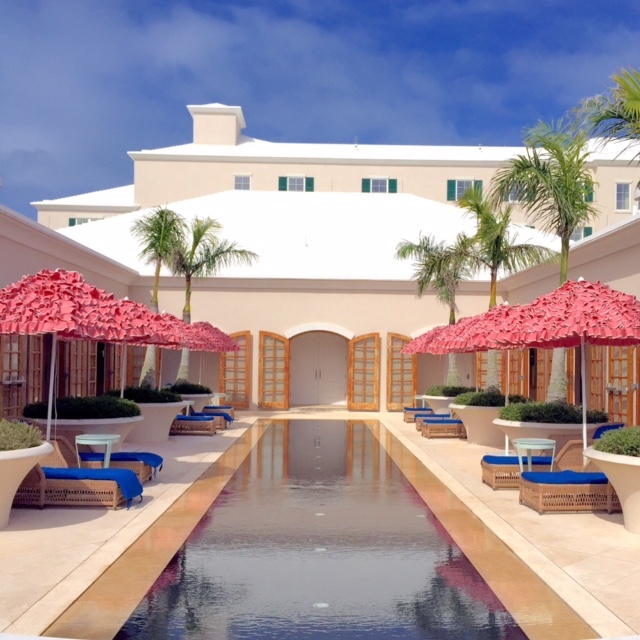 Rent a private cabana at the Palm Court pool, or enjoy sunning on its plentiful chaise lounges overlooking the Coffee Chine Grotto. As you approach the Palm Court Pool, you’ll pass the croquet lawn and Sense spa. Spa treatments book quickly, so you’ll want to arrange for spa treatments before or at the very start of your stay. 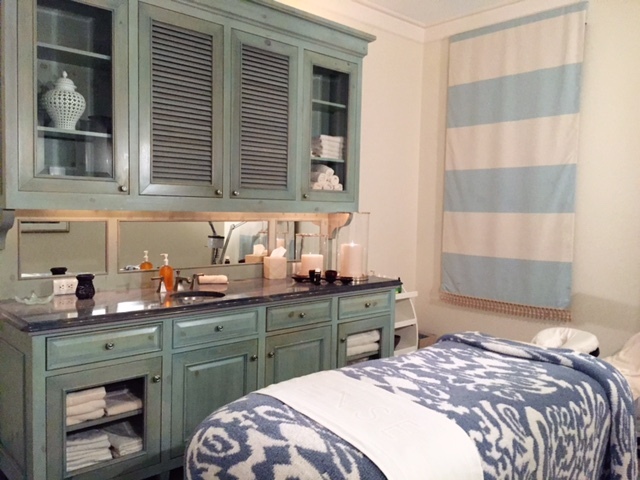 Prepare to be spoiled during your time at the spa. The space is indulgently charming and I can personally vouch for their Cedar Warming Massage. Bermuda isn’t known for being on the list of budget travel, but there are ways to make your trip more affordable. Rosewood Tucker’s Point is a luxury accommodation, so bargain hunters beware. 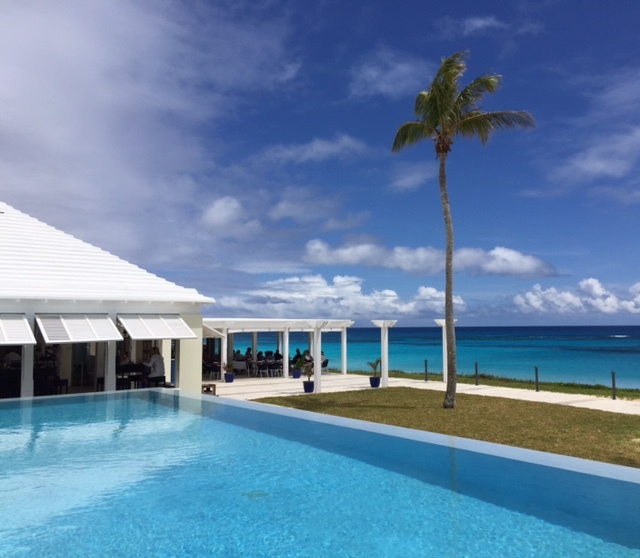 A great source for Bermuda travel deals, including resorts like Rosewood, here. Also research perks that cards like the Platinum American Express offer. 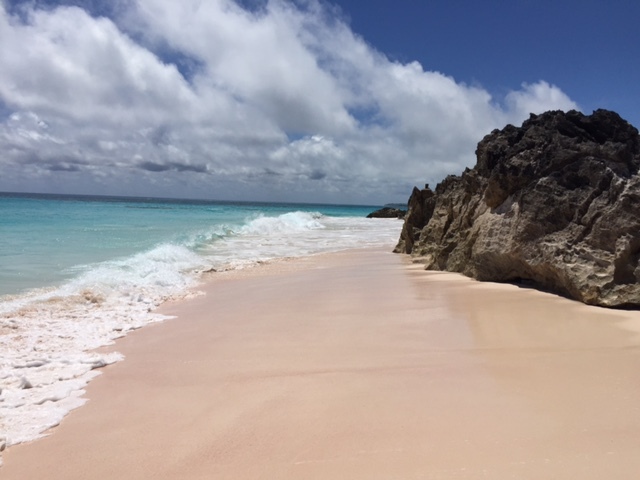 Have you visited Bermuda? I’d love to hear about your favorite things to do on the island. We usually stay in hotels when traveling, but have booked our first stay using Airbnb and want to be sure that everything goes well. Communications with our host have been so warm and helpful that I’m starting to wonder if we should bring a hostess gift or if there are other things to be aware of. What’s the etiquette for Airbnb? Airbnb has definitely changed the way a lot of people travel by allowing the intimacy of staying within a home in lieu of a hotel. A good guest is always considerate of their host. You’re paying guests during your Airbnb stay, however, which can make some things confusing. These tips should clear up the basics. Before Arrival: Communication with your host is important from time of booking throughout your stay (keep an eye on your email). Top priority is confirming your arrival time and adhering to it. Unlike a hotel, there is no front desk that is attended at all times. Notify your host immediately if you’re running late, with an apology. This bit of consideration will allow them to adjust their plans accordingly, as they may be taking a break from work in order to bring keys and get you settled in. During Your Stay: This experience is different from a hotel; don’t anticipate daily turndown service. 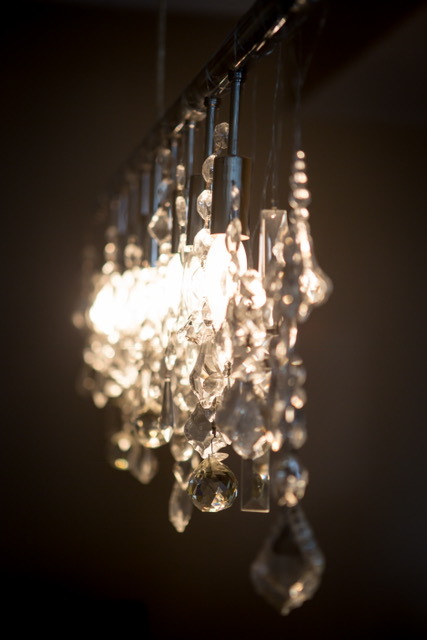 Keep your surroundings clean – especially in designated common areas. Also, keep an eye out for a manual or framed document sharing the Wi-Fi password, local restaurant suggestions and house rules that might include designated quiet times and whether food in the fridge is yours for the taking. If you run into any difficulties, relay those to your host. Their goal is to ensure you’re comfortable during your stay, so allow the opportunity to accommodate your requests. Upon Departure: The Girl Scouts camping rule of leaving things better than you found them works particularly well here. Refer back to the house instructions for guidance on where to place linens, taking out trash, where to leave the keys at the end of your stay. You never know if another guest is coming hours beyond your departure time. Should your plans change, be sure to notify your host and remember that you’re being rated as a guest, as well. Gifts for the host aren’t necessary. However, if you’ve built a rapport, a small token of appreciation and/or thank you note will be well received. Your kind review via Airbnb means a lot to your host, and will help other guests choose their location in the future. A last minute trip to the beach (literally booked the day before) lead us to a three-night stay on Hilton Head Island (HHI). Only a 4-hour drive from Atlanta, it’s surprising that my family waited over a decade to revisit. Our experience was definitely better with the girls as teens rather than toddlers, although you shouldn’t hesitate to head over with your little ones. 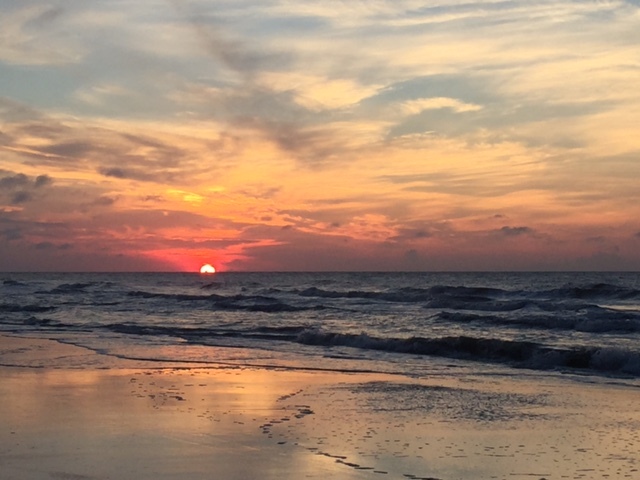 It’s easy to see why Travel & Leisure has voted HHI the #1 Island in the Continental U.S.
Booking a stay during the week of Independence Day can be a challenge, so do plan ahead! 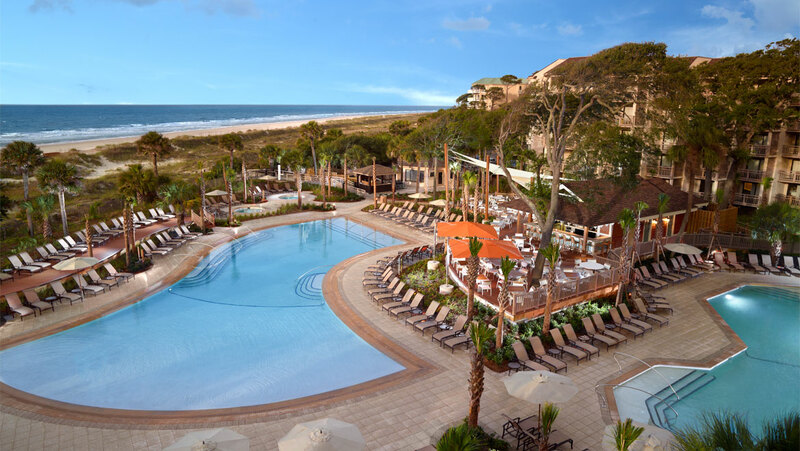 Fortunately, we were able to find accommodations within the Palmetto Dunes Resort Community at the Omni Hilton Head Island Oceanfront Resort. This luxurious Lowcountry property is beautiful and the staff most welcoming. 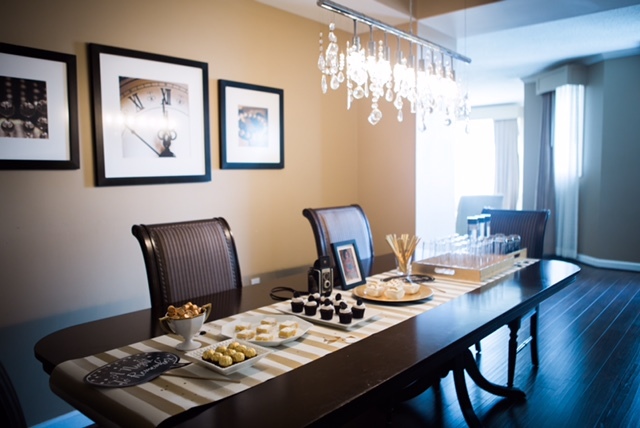 Upon check-in, anticipate glasses of champagne for the adults and cookies and mango lemonade for the younger guests. 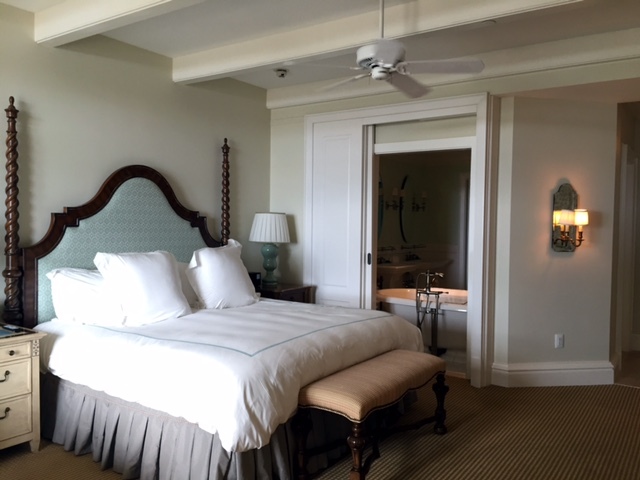 The girls are a bit older now, so we opted for the Luxury Oceanfront Suite, which gave us ample room both inside and out on the balcony. This resort has daily activities available to keep you on property, and an Old Skool burger my family raved about, but we decided to explore a bit. Arriving just after 3pm, everyone was looking forward to a late lunch. The first request was for something “easy” so I suggested heading to Java Burrito. You’ll quickly find that building codes restrict any blaring signage for businesses, so use Waze and keep your eyes peeled for the outdoor shopping plaza that houses Java. 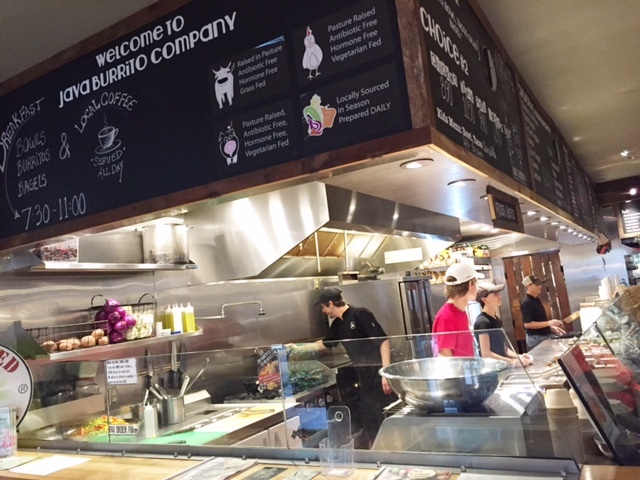 If you’ve been to a burrito bar like Chipotle, you’ll know what to do upon entering. Just know that, no matter the toppings you choose, this is going to be way better! Everything is extremely fresh, locally sourced and sustainably raised. In fact, I spied a bushel of unshucked corn behind the register. Coffee is available, too, hence the name. Arrive between 4-6pm and enjoy the freshest margarita you’ll find on HHI during Happy Hour. 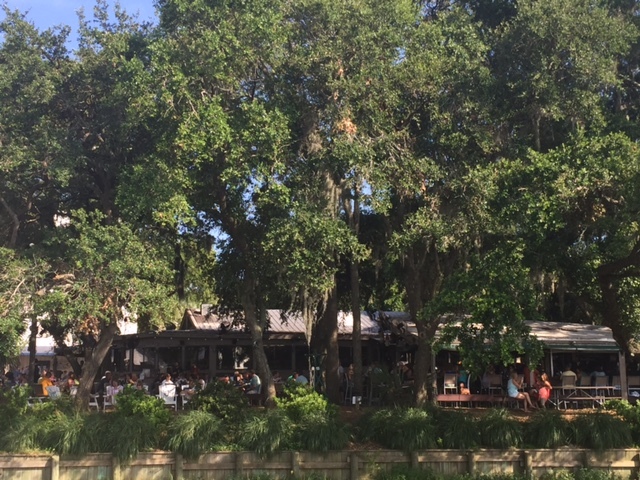 If you’ve come to HHI in search of fresh seafood, don’t mill Skull Creek Boathouse. There will likely be a wait for those coveted outside tables beneath a canopy of mossy trees. Aim for a late lunch. If you don’t time it right, parking will be farther and the line will be longer. That being said, it’s more than worth the wait. The food is fabulous, service top notch and the atmosphere is very laid back, so relax and take in the live music and beauty of the marina and be glad you’ve dodged the touristy spot (we didn’t) and found a treasure the locals enjoy. Near the hotel, you’ll find the newly built Shelter Cove Town Centre which houses Poseidon. Consider this your go-to if anyone in your group has food restrictions. Seafood and cocktails are at the ready, but there are plenty of gluten free options and a kids menu to satisfy the most challenging palette. Don’t miss their tomato pie! As for the first meal of the day, we tried a few places, but enjoyed our first and last the most. Watusi is a charming restaurant and the perfect choice for a healthier breakfast and great coffee. Harold’s Diner offers no-frills but very tasty and budget friendly breakfast classics coming hot off the griddle — cash only and do follow the rules. Situated between the Calibogue Sound and Atlantic Ocean, Hilton Head gets a bit steamy; you’ll want to pace yourself with outdoor activities. 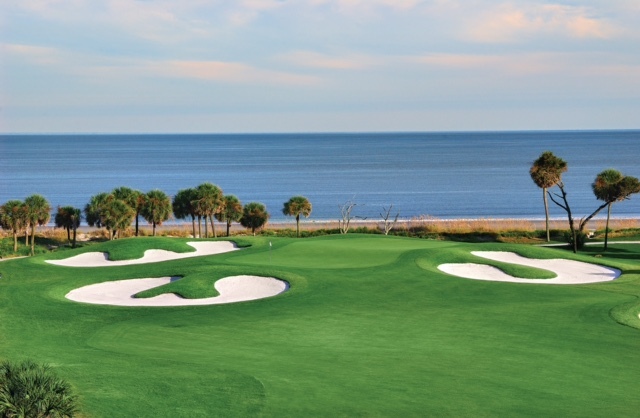 There are three championship golf courses at Palmetto Dunes. The hubby enjoyed one designed by Robert Trent Jones while the girls and I shopped the outlets. The carts are air conditioned, but I strongly urge you to reserve the earliest tee time available so that your game isn’t affected by the heat. Want even more golf? There are lots of options for playing putt putt. We found lots of shade and a fun but challenging course at Legendary Golf. You can’t hide from humidity, so be sure to drink water and grab one of my favorite frozen treats, a cherry flavored Screwball, from their cooler before hitting the links! My family loves going to the movies, and I was able to find a theater with the same reclining seats we’re accustomed to in Atlanta. Now, the theater is much smaller, but four adults can catch a matinee for $30 with online ticketing. Head to Park Plaza Cinema if there’s rain in the forecast or you don’t want to miss a new release. Of course, back at the hotel there are pools to explore, sugar sand beaches to wander and s’mores to be made. If planning your first trip to Hilton Head, don’t miss going the iconic red-and-white-striped Harbour Town Lighthouse. 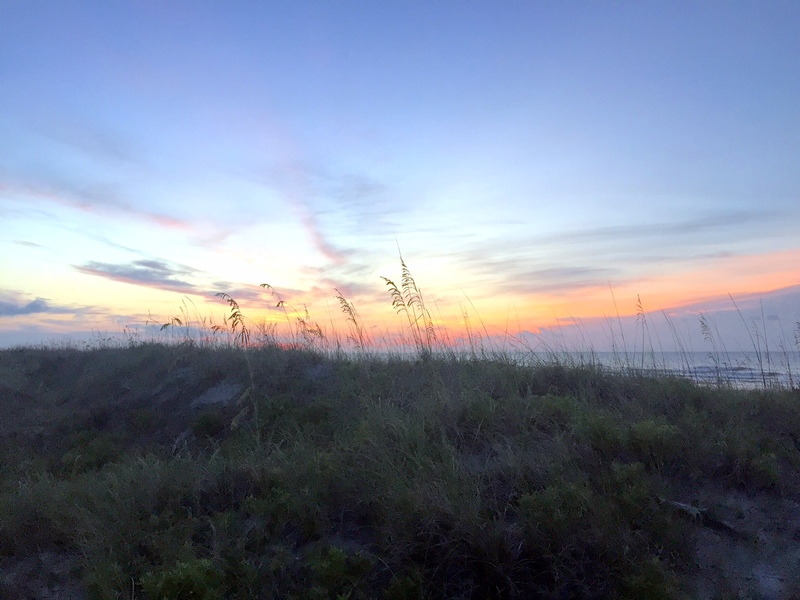 With all we did during our 4-days at HHI, we left plenty of items on our to do list for the next time we need a beach getaway. And something tells me that with our oldest headed into her senior year of high school, that will be sooner rather than later! I recently chatted with Hannah Norling. A Northerner who’s recently made her way to the South, Hannah is chronicling her adventures via her Northern Southerner posts. Here are her takeaways from our conversation as originally posted by Southern Living. 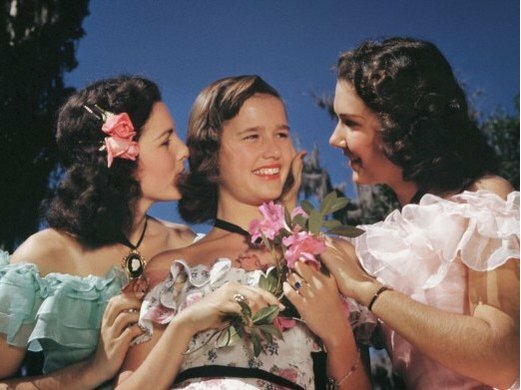 The South had rules of its own, and the women are charming as all get out. I wanted to find out more about the sweet, sweet life of a Southern Belle. 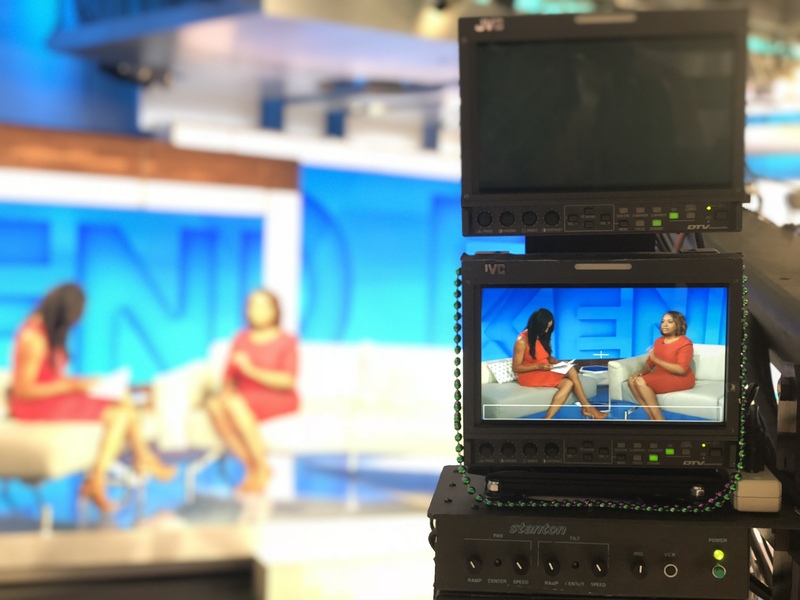 I called up Erika Preval, our charm and etiquette expert to give me the 411 on what it means to be Southern, charming, and classy as all get out. Here’s what I got out of it all.I’ve never really considered myself polished. I mean, I learned how to say please, thank you, and how to eat spaghetti with a spoon and fork. You know, fancy American-Italian family stuff. 1. This isn’t necessarily Southern, but I wanted to know why there are so many forks when you go out to a fancy dinner. You probably already know, there are forks for every course of the meal. Seafood, salad, main entree, and dessert. Forks, forks, forks. Forks galore. 2. When you look at your phone too much, you become a phone zombie who has bad posture. Don’t be a phone zombie, because no one likes zombies, and Southerners don’t like bad posture. Try looking up, put the phone away, and imagine a string pulling you up straight. 3. If you’re trying to break your swearing habit, use buffer words. Which all just happen to be related to sweets. Sugar, fudge, honey sweet ice tea, and butterscotch, (I threw that one in there, for safe measure). 1. Seersucker is only appropriate after easter and definitely not appropriate at Christmas time… And for your sake, please don’t wear it in December. Seersucker is a light fabric, and December is drafty. 2. The season for white is between easter and labor day, but not after labor day. Ya hear? 4. Never leave the house without pearls, have emergency pearls for pearl appropriate situations. Even if it’s not pearl appropriate, throw those suckers on and you’re golden. 1. Always consider others, be thoughtful and genuine. 2. Be attentive. When you don’t make eye contact with people, it’s considered rude here. Value the people you’re with, and look them in the eyes. Smize the sugar out of them. 3. Never show up to a party/gathering empty handed. Presents + you = friends. No presents + you = bless her heart. 1. If a man doesn’t walk on the curb side for you, he has a few things to learn about gentleman-like manners. Send him to Erika Preval and she’ll set your beau straight. 2. If a man wants to take you on a date and you’re not feeling it, just be honest. Don’t say you have a boyfriend, because then it’s a month down the road, and you’re scrambling to make up an occupation, age, and Facebook profile for your fake boyfriend Adam who works in accounting and then you’re kind of cat fishing yourself. No one has time for that! Bottom line, the truth will set you free. I learned a lot talking to Erika, and I still have so much to learn. First of all, I believe what will truly help me, is if I kept Erika on speed dial, so I can ask her questions all the time. Second, I think I need to just dive in head first. If you’re looking for me, I’ll be working on my fancy skills. You know, learning to fox trot, curtsey, or saber a wine bottle with a sword. Want more of the Northern Southerner? Find it here. During my last vacation, I used Uber for the first time and loved it! Before a conversation with friends, I didn’t know there was a passenger score, and I’m surprised that my average rating is 3.0 stars. Nothing went wrong during my rides, but maybe I’m not privy to Uber etiquette. Can you share some tips for reaching a 5 star rating? 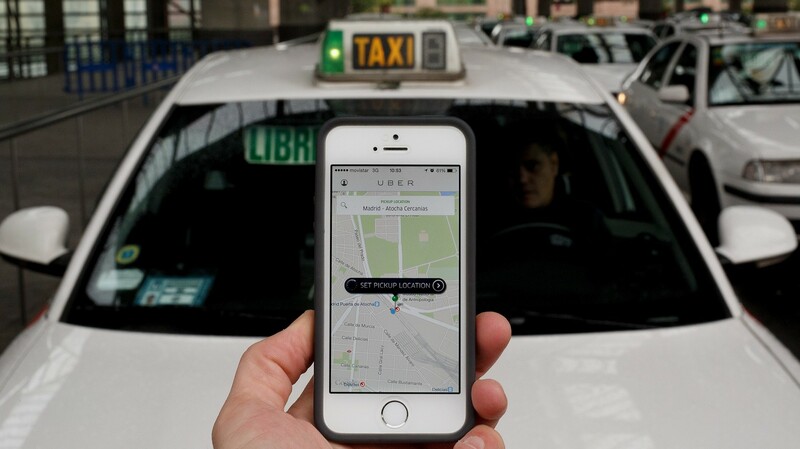 I also love the convenience of rideshare services like Uber and Lyft – especially when traveling. When in the company of others, etiquette always comes into play, and with ride-sharing, you have the opportunity to rate one another’s level of consideration during your ride. Anything less than 5 stars and your driver may be penalized. Likewise, your receiving less than a perfect score could result in longer waits for pickups – too low and you might find drivers hesitant to pick you up at all. Consider each Uber ride as a reminder for making a great first impression and watch your rating improve. Sitting, Waiting, Wishing – You’d never arrive to a lunch scheduled for Noon at 12:10pm, likewise don’t make your Uber driver wait; order your pickup when ready to go. Making your driver wait can lower your rating before your ride begins. If the app says your driver is 5 minutes away or less, this is especially important, as that time can quickly diminish once headed directly towards your location. Should you find yourself running behind, send apologies to your driver via text, just as you would your lunch date. Where’s Waldo – Don’t rely heavily on the GPS function of the app. Uber doesn’t have designated spaces for pickup, like taxi stands, so inputting your address is of importance. Identify a location that isn’t confusing and allows you to enter the car safely – even if it means walking around the corner, so that your driver doesn’t risk a traffic ticket or accident. You can always text your driver identifiers: “I’m wearing a red raincoat,” as you would for any other first-time meeting. Introduce yourself to ensure you’re entering the right car. Last Things First – Once the ride is completed, your driver will likely be picking up another passenger. Leave things better than you found them – no lingering scents or left behind personal items/trash. Uber doesn’t require tips, and unlike Lyft, doesn’t offer a tipping option within the app beyond UberTaxi service. Offering a gratuity will make you stand out (small as a couple of dollars cash) and that’s always the goal when making a great first impression, even if all things preceding the end of ride haven’t gone smoothly. I’ve been diligent in following this Uber etiquette during my travels and have maintained a 5 star rating. Follow these tips and your star count should rise, as well. 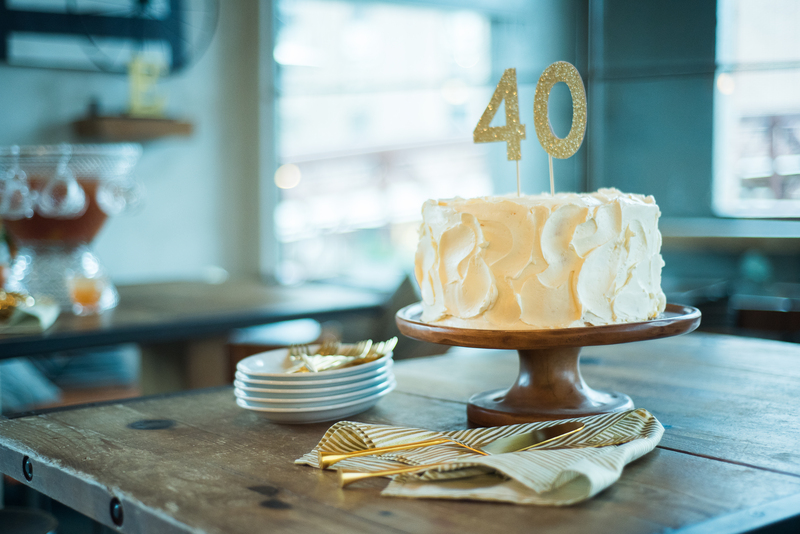 OH, LIFE BEGINS AT 40! It wasn’t until my second Wall Street internship that I started paying attention to the number 22. For two summers in New York, I’d worked on the 22nd floor. And my first job afterwards was on the 22nd, as well. When Spelman College numbered its buildings, I suppose for the sake of mapping, my freshman dorm was designated building 22. Our wedding anniversary is on the 22nd and our first child was born on my mother in law’s birthday: the 22nd. I could give you countless 22s throughout my life, but the most recent is that 22 years ago, Oprah turned 40. Since watching her celebrate that birthday on TV, I’ve looked forward to this milestone birthday. The show had plenty of celebrities on hand to share their wisdom, but it was the wisdom and sense of self that Oprah had that made me feel that by the time I reached 40, I’d have also gained the clarity and posture with which to live my best life. And that has come to pass! So, I sent out invitations to as many guests as I could afford to pay for, asking they join me for some bourbon, champagne and Southern small bites. (Tip: When hosting your own party, guests should leave their wallets behind — cover all costs.) 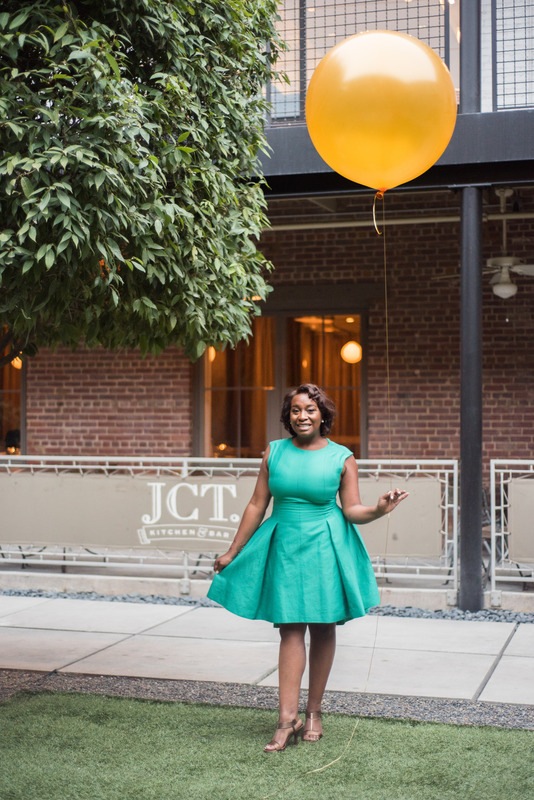 Ever sentimental, I wanted to host the event at the location one of Charm’s first partnerships, JCT. Kitchen & Bar, and put together a floral arrangement in my grandmother’s punch bowl so that she could be there, as well. It was the perfect evening to begin my best years! A three-day weekend is quickly approaching! In case you’re looking for a great road trip destination, do allow me to suggest a drive to Nashville, Tennessee. Should an aversion to country music have you thinking it’s not the ideal destination, know that the Music City has far more to offer. If you enjoy good food and good times, Nashville is one of the hottest places to visit in the South, and just keeps getting better. Here’s a snapshot of all that you can get into with three days to spare. Although it sells out quickly, do your best to reserve a room at the Omni Nashville. 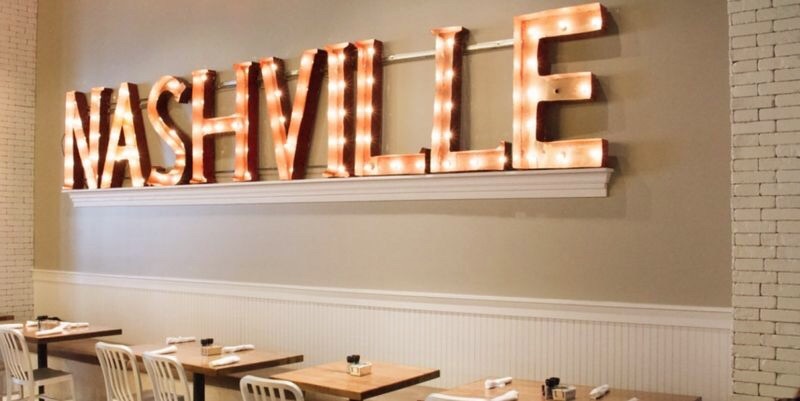 Located in downtown Nashville within walking distance of the hubbub of Broadway, this unique hotel has multiple restaurant options, rooftop pool, and impeccable service. Sold out? Make your way to Union Station Hotel – a bit more demure but absolutely charming. Breakfast: You don’t want to leave Nashville without having a proper biscuit. A bit of a drive will lead you to Loveless Café. If you’d prefer staying near downtown head over to the food truck offshoot Biscuit Love in The Gulch. Don’t question it – order the bonuts for starters. 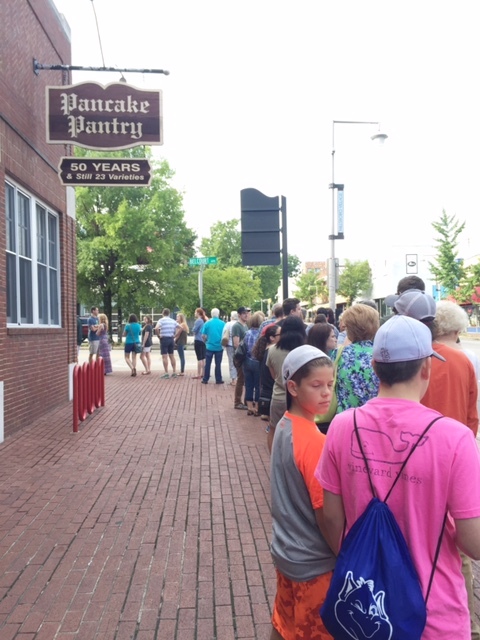 Arrive early to avoid the (long) line at Pancake Pantry; it’s definitely worth the wait. Or simply head downstairs to the biscuit bar at Kitchen Notes in the Omni lobby. 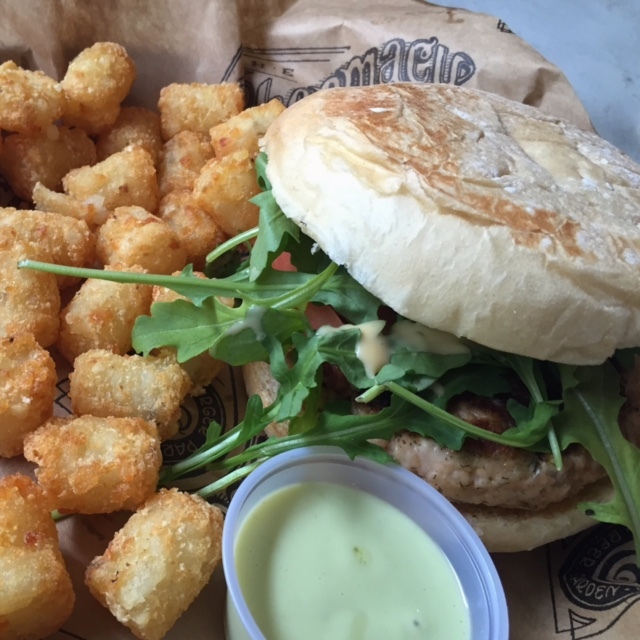 Lunch: Options for lunch are endless, but you won’t go wrong making your way over to East Nashville for burgers and tots at The Pharmacy. You’ll find another former food truck, Mas Tacos Por Favor, right across the street. Beyond tacos, be sure to order their chicken tortilla soup (chicken can be omitted) and elote. Cash and checks only. Feeling nostalgic? Head over to Puckett’s Grocery. A doable walk from the hotel, make a pit stop at the Goo Goo Shop for a sweet treat after dining at this historic meat and three. Dinner: When traveling, we tend to sleep in a bit, which throws off a typical three squares a day timeline. 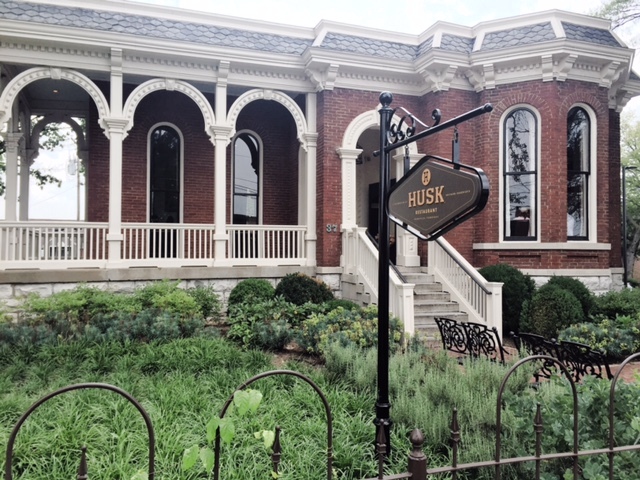 Those times we were hungry enough for a full-fledged meal, we headed to Husk’s Nashville location (the original is in Charleston), which never disappoints. If you’re lucky, you’ll dine next to Elvis at Demos’ Steak and Spaghetti House. Order any of the amazingly generous and yummy pasta dishes, but not steak. Trust me. 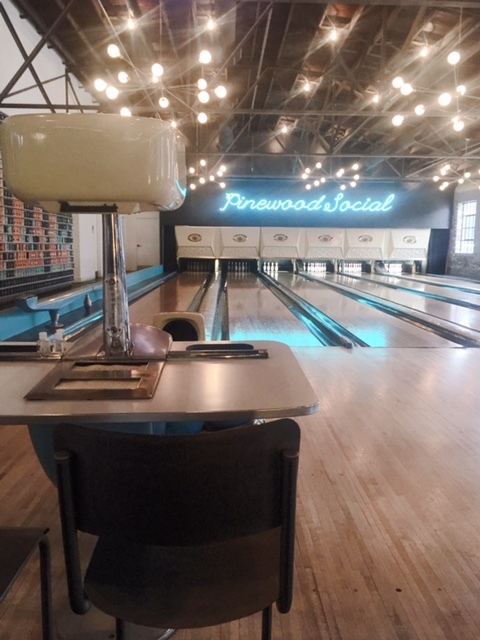 Reserve a bowling lane at Pinewood Social. These book up weeks in advance, but opting for an early evening time might work to your advantage. The Escape Game is also a fun family-friendly activity for tweens and teens. Once the kids are settled in with the sitter, head to The Patterson House for superbly crafted cocktails in a speakeasy setting. Get there early to avoid a wait. Do share your Nashville favorites (don’t miss shopping in downtown Franklin, TN) and travel safely! 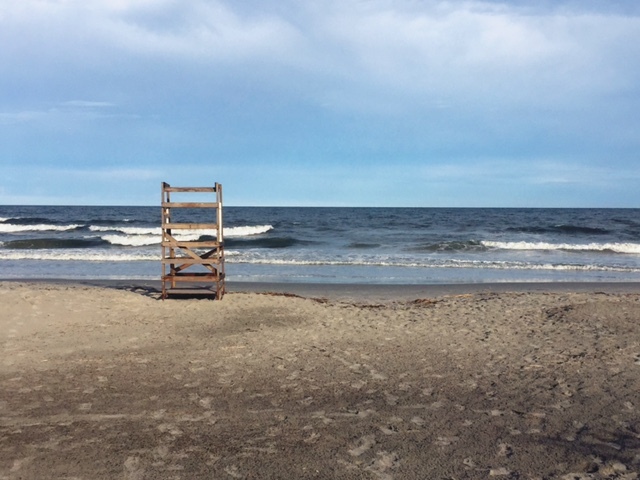 Three months after Charm Etiquette’s launch, I excitedly headed to Jekyll Island to attend the inaugural Southern Coterie Summit. Without a doubt, I walked away with lots of advice to get me confidently on my way as an entrepreneur and writer. What I’d not anticipated gaining, however, were the lasting friendships that have grown since that time – well worth the investment! One such friendship is with Jill McKenzie. She and her husband, Steve, have so kindly supported my entrepreneurial efforts. 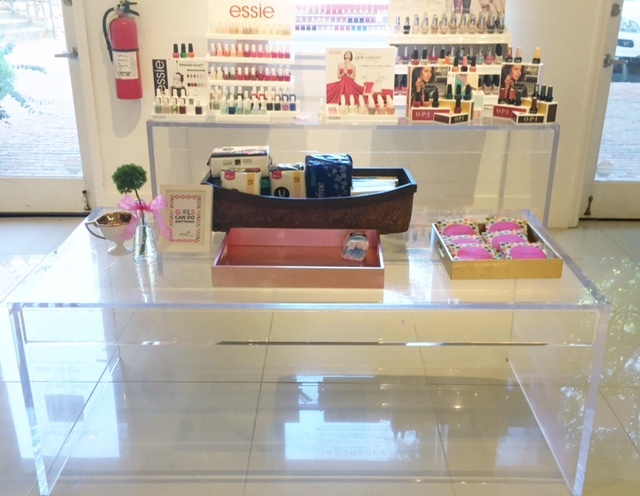 In fact, they recently hosted a group of Charm teens within their storefront. We recently collaborated to share some etiquette tips for hosting holiday houseguests with their audience, and I’d love to pass those along to you here. Happiest of holidays to you and yours! 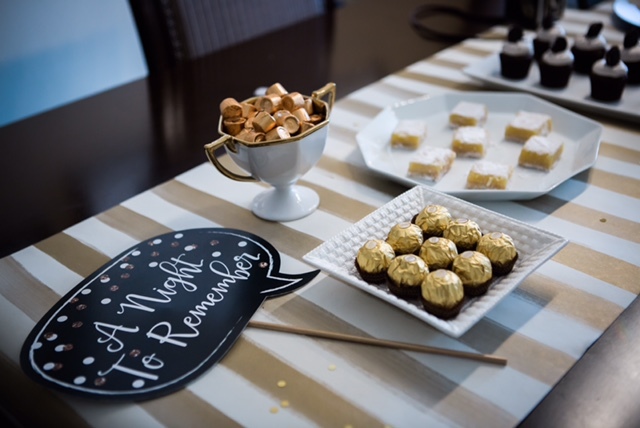 Hosting any type of event during the holiday season can be extremely stressful; hosting holiday house guests can increase your stress level tenfold. Consider all of the potential situations that may arise, and you just may find yourself saying there’s “no room for you at the inn.” Fret no more, we’ve turned to THE expert in etiquette – CEO and Founder of Atlanta-based Charm Etiquette, Erika Preval – for the best advice when dealing with holiday house guest conundrums. Holiday house guests are on their way! You’ve stocked the fridge, put out fresh towels and placed a carafe of water on the bedside table of the guest room – perfect Southern hospitality. You’re fully prepared to receive guests, but it’s often those surprises hosts didn’t anticipate that can shift things from charming to alarming. Here’s a primer on how to handle any house guest snafu gracefully by being a relaxed and considerate host. Early to bed, Early to rise! Try to anticipate what your guests will need to be self-sufficient. If they’re early risers, be sure to put out any needed tableware to eliminate the need of rummaging through your cupboards. Also, having some easy to prep foods available (think croissants, quiche, fresh fruit, etc.) and giving a tutorial on using your coffee maker will allow them to enjoy their typical morning routine until you awake. Conversely, for the guest who stays up past your bedtime, sharing knowledge of how to operate your TV remotes, the Wi-Fi password and reading materials should keep them entertained in your absence. You’ll want to be certain that you’ve stocked your bar cart so that they might enjoy a nightcap, as well. Is there a doctor in the building? Your house guest becoming ill during their stay is something neither of you can control. It is, however, the perfect time for you to show compassion and make your guest feel as welcome and comfortable as possible. Offer to prepare tea or soup and go to the drugstore for any medications that might ease symptoms. Prepare the guest room with plenty of reading materials and a television to keep them entertained, well rested and contained, should anything be potentially contagious. Making a guest feel they need to relocate to a hotel while they’re sick would be a major faux pas, unless their symptoms were a serious threat to the health of others within the household. Is there meat in this? Dinner is ready and you bring to the table your famous lasagna bolognese, only to learn your guest is vegetarian. This scenario is often difficult and awkward for both sides. Ideally, your guest would’ve discussed their dietary restrictions and preferences prior to their arrival. However, as the host, your role is to always ensure your guest feels comfortable, so take a deep breath and consider other quick options for their meal. There is likely a workaround if you have prepared or have the fixings for a green salad or an ample amount of vegetable side dishes. A sincere thank you to Erika for sharing her wealth of etiquette knowledge in this holiday house guest blog post for steve mckenzie’s! As you can see, she’s one smart cookie and we’re so grateful to have become friends with such a charming person. If you’d like to learn more about Erika and the fantastic services she provides through Charm Etiquette, please check out her website here. Good luck with your house guests and happy holidays! 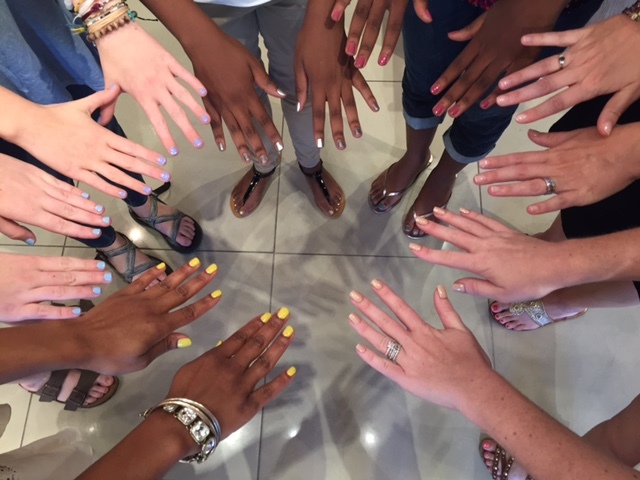 I’m hosting a new group of teens, through March, as part of Charm’s Polished series. It just so happens that this group is comprised solely of young ladies ages 13-16. We will meet in topic-related locations each month, and kicked things off in November at Steve McKenzie’s. Locally owned by artist Steve McKenzie and his wife Jill, the storefront is filled with furniture, decor and gifts for the home and was the perfect space for our guests. Steve even took the Polished teens on a tour of his studio – such a treat! If you’ve not yet stopped by, I encourage a visit. You’ll enjoy the hospitality of Steve and Jill and quickly understand what makes theirs a charming place to shop. The holiday season is here, which means lots of potential travel to be with family and friends. I’ve partnered with Ford Motor Company to share their tips for a more charming road trip. Although the words are not my own, I agree wholeheartedly with the advice shared. This post is a bit longer than usual, but hang in there until the end – it’s chock full of great tidbits! Safe travels and the happiest of holidays to you and yours! Holiday driving can cause more than road rage – it can wreak havoc on relationships. Whether stuck in Thanksgiving traffic or riding for hours with the in-laws, the “most wonderful time of the year” has serious potential to turn family fun into family feud. Last Thanksgiving, AAA predicted 46.3 million Americans traveled more than 50 miles from home – the greatest distance in nearly a decade. Now, with drivers enjoying the lowest gas prices in five years, AAA estimates 90 percent of Americans will celebrate the holidays this year with a road trip. But fear not – avoiding common road frustrations is often as simple as minding your manners, even before you arrive at Grandmother’s house for dinner. To help ease the stress of holiday travel, Ford Motor Company and The Emily Post Institute are working together to offer you a better road trip experience. As the great-great-grandson of America’s foremost etiquette expert Emily Post, Daniel Post Senning shares how simple car courtesies can make travel more enjoyable for driver and passengers alike. From polite passenger protocol to considerate use of new vehicle technologies, these easy “drive-by” tips will have families singing fa-la-la-la-la in harmony this season. First and foremost, drivers are hosts. You wouldn’t invite family and friends to your home without planning for their comfort and entertainment, so why get behind the wheel without thinking through the drive? With these tips in mind, modern-day drivers are sure to experience comfortable and enjoyable travel. Chivalry’s not dead… it just looks different nowadays. Holding the door for someone will never go out of style, but with automated keyless entry and remote start, modern protocol can prove puzzling. Today, driver chivalry means unlocking the door before Aunt Ethel even tries to open it, or getting the heat (and even the heated seats) going before Grandma buckles up for a chilly trip to Christmas dinner. Let the grand tour begin. Your passengers may not be all that familiar with your ride. Put them at ease; give them a tour to help them feel more at home. Just like you would show a guest at your home where the restroom and kitchen are located, let passengers know about the controls they have for entertainment systems, seats and windows. Identify power sources for phones and electronics, like the smart-charging USB ports in the rear of the vehicle that provide easy access. Make sure all of your passengers have what they need before your trip begins. Content beats boredom. When stuck in dreaded Thanksgiving traffic, a little preparation goes a long way toward preventing boredom. Before hopping behind the wheel, curate your upcoming road trip with podcasts, audiobooks, TED Talks – even online classes. Traveling with pals to your annual Friendsgiving gathering? Build a Spotify playlist from your senior year, suggest a series, or learn something about your destination together. With in-car entertainment and communication systems like Ford SYNC 3, it’s easier than ever to bring a world of content along for the ride. If the driver is host, the passenger is honored guest. You wouldn’t show up to your Chanukah host’s home empty-handed, so don’t forget the same courtesy for your driver. To thank him or her for bearing the stress of high-pressure holiday driving, lighten the load by taking on some responsibilities of your own. Offer to help pay for gas, fetch snacks and drinks, and pack the car with suitcases and holiday gifts. Communication is key in relationships, both on and off the road. Effective preparation goes hand-in-hand with clear communication – between driver, passengers and their vehicles. Know how to communicate on the road to ensure you and your crew arrive safely and in harmony. To Grandmother’s house we go. Traveling with family? Avoid the stress of incessant “Are we there yet?” conversations by building an itinerary and communicating your plans. Talk about stops for food and restroom breaks so everyone knows what to expect. Kids can follow along, track progress, anticipate their favorite spots – even figure out arrival times on their own. With easy-to-use navigation provided by Ford SYNC 3, you can determine the quickest route, locate family-friendly pit stops along the way, and plug in your itinerary in advance to keep the trip on track. Don’t play the passive passenger. If you’re lucky enough to be sitting in the front passenger seat on a long journey, assist your driver through helpful communication. Be sure to stay alert and keep an eye out for road signs. (Do try to refrain from refreshing your Instagram feed every five seconds.) Above all, avoid all comments on how your chauffeur is driving – no one likes a back seat driver, especially when road conditions turn stressful! Chat with Mimi more than Siri. Voice activation puts a whole world of information at your command from the driver’s seat, whether locating the next rest stop or calling Grandpa hands-free to let him know you’re just up the road. With today’s voice recognition clearer than ever, people aren’t just naming their cars – they’re talking to them! Just be sure you talk to your real passengers at least as much as you communicate with your car’s infotainment system. New technology means new manners. In 1949, when Emily Post first wrote about automotive etiquette, the car was the technological innovation. In today’s technology landscape, cars come with growing app libraries of their own – and just like smartphones, nearly everyone can use a reminder on their polite use. Make sure in-car innovations serve to enhance, not hinder, your enjoyment of holiday travel. Connectivity caution. When traveling through remote areas on the way to your holiday celebration, you might – gasp – lose cell reception. Know your car’s navigation system capabilities, do a brief review of the major roads you’ll be traveling ahead of time, and keep actual maps in the car – ensuring you have a backup plan if connectivity goes out. Download a GB or two of your favorite music to help get through those pesky “no streaming available” zones, keeping passengers calm, cool and collected – no matter what the journey brings. Diffuse tension in a tight space. We’re all familiar with the drama that can ensue when hitting the road for the holidays. From arguments over the middle seat to debates over the radio station, tight quarters can lead to curt conversation. To diffuse tension, call on in-car features to lighten the mood. From massaging seats, to a literal change of tune on the radio, your car’s systems can help ensure the continued comfort of your passenger-guests. Support existing safety systems. Battling the tryptophan haze after a big Thanksgiving dinner? Remember, the temptation to fall asleep on the way home affects both driver and passenger. If you’ve been spared the role of designated driver this holiday season and are riding comfortably in the passenger seat, don’t begin to snooze as soon as the heated seats kick in – stay alert and talk with your driver. Smart driver-assist features like Ford’s lane-keeping aid are incredibly helpful tools, but extra eyes on the road never hurt! Be kind, respect the lines. We all know not to fight over precious parking spaces, but it goes further than that. In a crowded parking lot on Christmas Eve, no one likes the Grinch who straddles two spots. Selfish behavior is never in style, but careless parking is especially frowned upon during the season of giving. Show respect to other drivers by staying between the lines – and if you’re not a master manipulator in reverse, no one has to know! Let advanced, semi-automated technologies like active park assist with perpendicular park and park-out assist help you squeeze in and out of that tight spot. 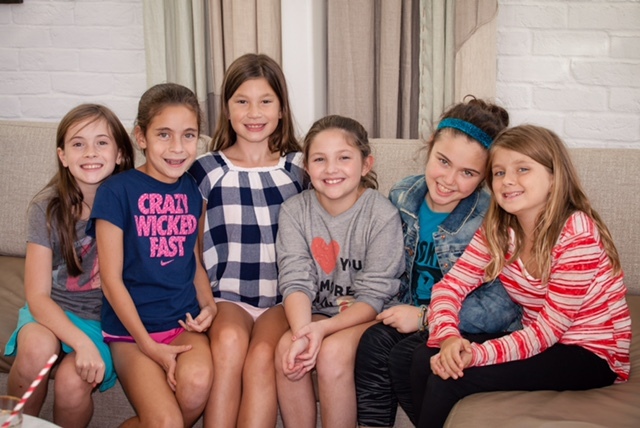 In October, I shared Monday afternoons with the most charming group of 9 year olds! 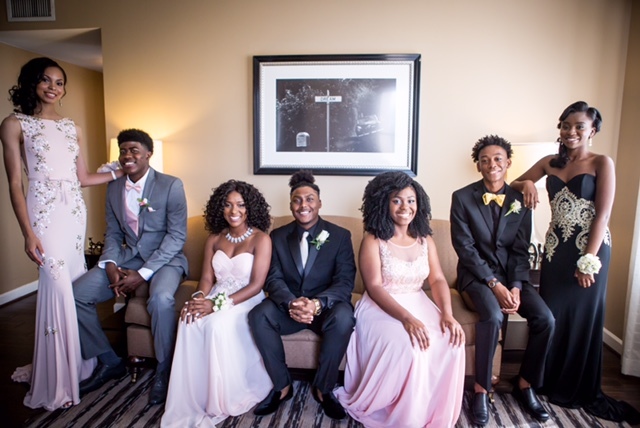 They attend the same school and have all been classmates at one point or another. Each guest was bright and full of both personality and potential. For most, this was their first time within our partner restaurant St. Cecilia, but one was quick to share with me how much she enjoyed eating their crudo – what an impressive palate. Best wishes to these future leaders and graduates of Charm (Grades 2-5)! It’s National Business Etiquette Week, and I’m celebrating by sharing quick tips for ensuring you’re viewed as a polished professional. Please follow along and share these posts that will appear throughout the week. Eye contact – Making eye contact is Etiquette 101, and the proper way to greet anyone. Evading eye contact often leads to distrust by the person you’re greeting. Looking someone in the eye is a display of confidence and that the person you’re greeting has your attentions. Stand up – If you’re seated when someone greets you, regardless of gender, stand up. It is a basic sign of respect and places you on the same level. You establish your presence when you stand. Stay dry – No one wants to touch a sweaty palm. Ensure your right hand is dry by lightly brushing it against the side of your pant leg or skirt when raising it. Your garment will absorb the excess moisture and allow for a dry, confident handshake. It’s National Business Etiquette Week, and I’m celebrating by sharing quick tips for ensuring you’re viewed as a polished professional. Please follow along and share these posts that will appear throughout the week! Cc/Bcc - People rarely want their email address shared with the public, as it often leads to spam. Avoid using the Cc: (carbon copy) field when sending emails to recipients who don’t know each other. Instead, use your email address in the To: field, and all others within Bcc: (blind carbon copy). The recipient will see your email address only. Reply All – When responding to an email with multiple email addresses displayed, you have the option to Reply or Reply All. Unless your response is relevant to the entire group, only respond to the sender using Reply. 15 responses of “I’ll be there,” can quickly crowd an inbox and wastes time. Subject – Always include a subject line for your email so that it’s not deleted, lost or unopened. The subject should be specific and straightforward, as the recipient will use it to prioritize opening. Excessive exclamation points or using ALL CAPS are digital equivalents of yelling. Italicize or use dashes instead.